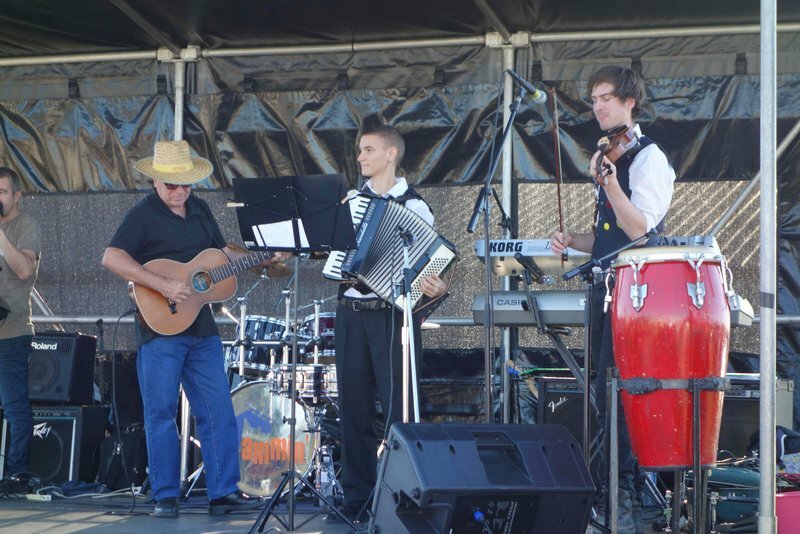 Other years: 2018, 2014-2015, 2012-2013, 2011 and earlier. 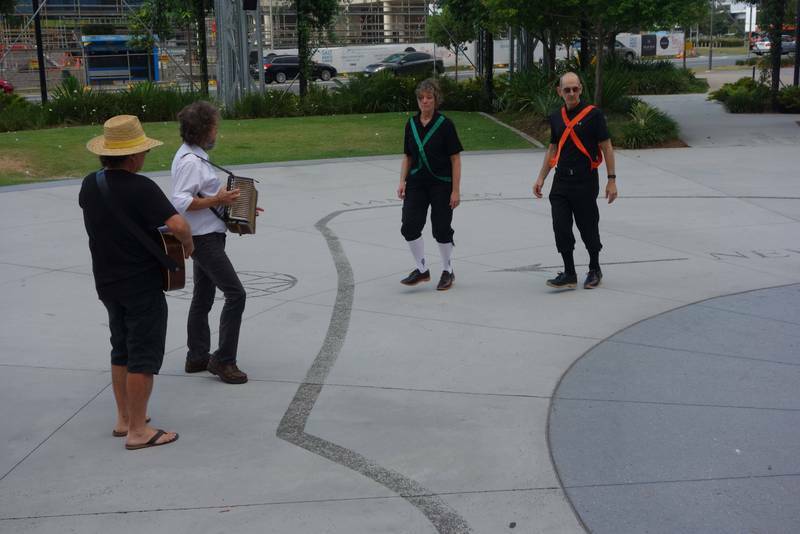 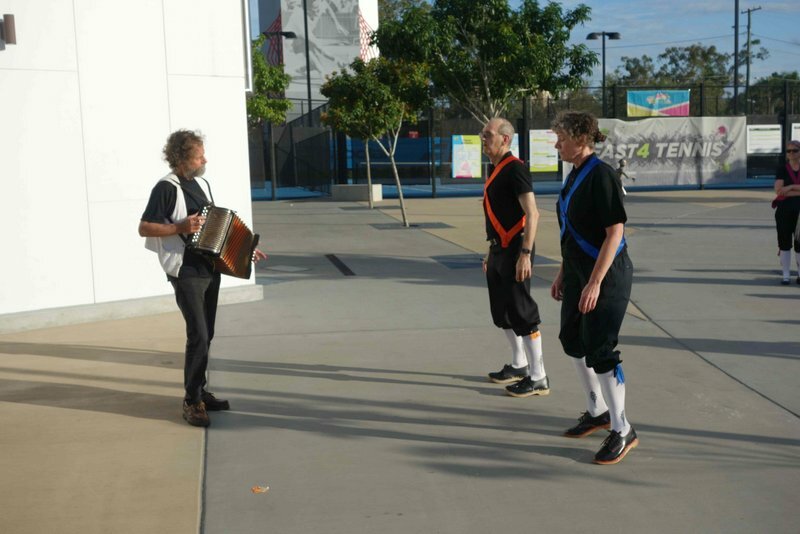 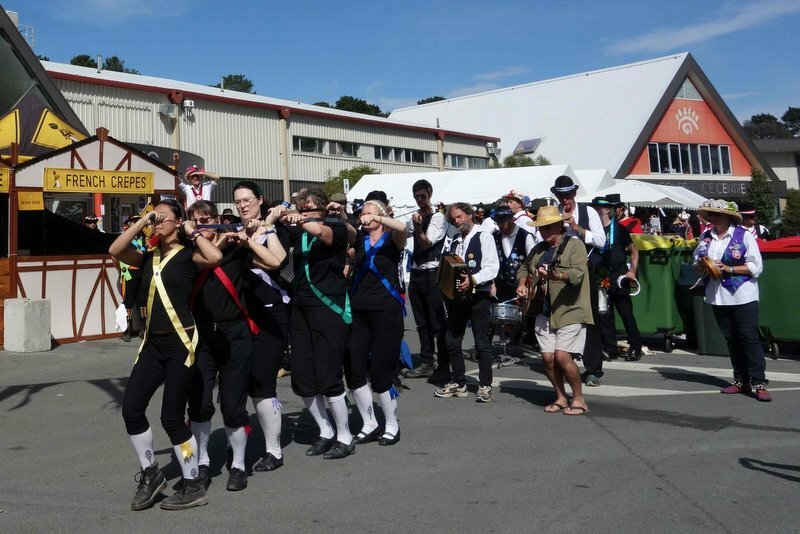 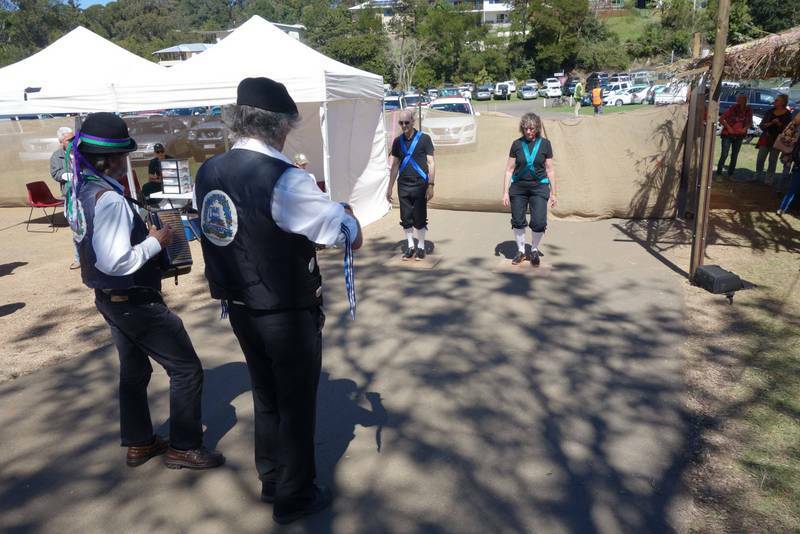 It may be steaming hot but BRASS is cool as we entertain the good folk at the Mid Summer Folk Festival with Clogging, Longsword, and Rapper. 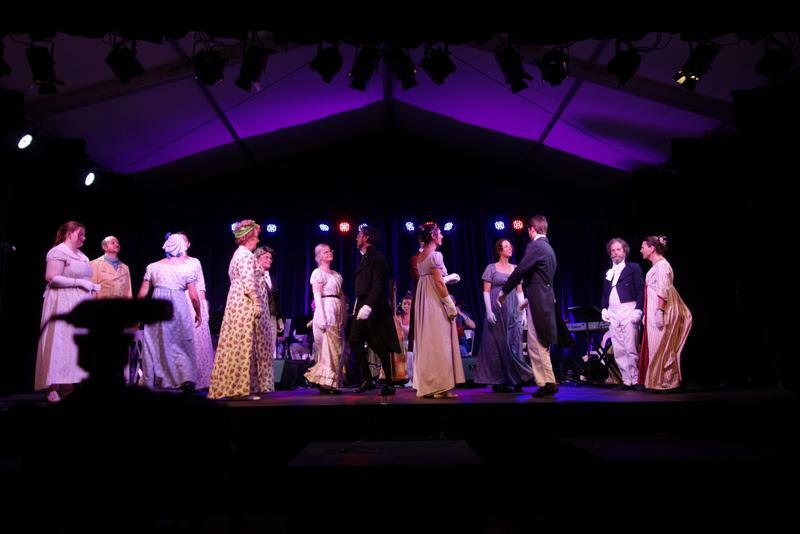 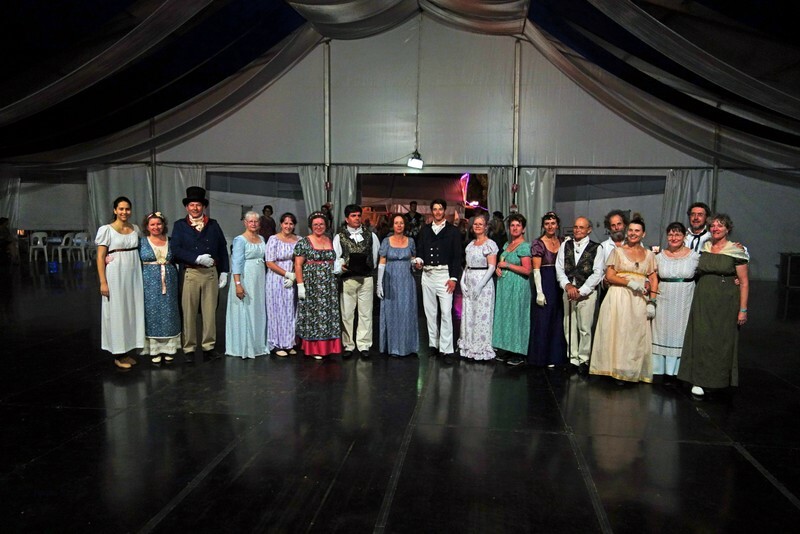 Dance Kaleidoscope recognise the 200th Anniversary of the death of Jane Austen with a stage performance (Letters to Cassandra) on the Folklorica Stage and an English Ball. 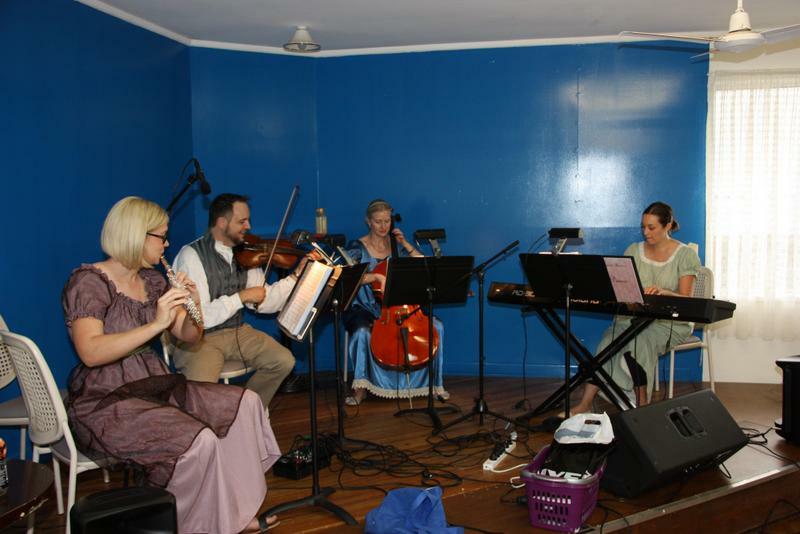 Our band is Sounds Austen under Jonathon Zorzetto. 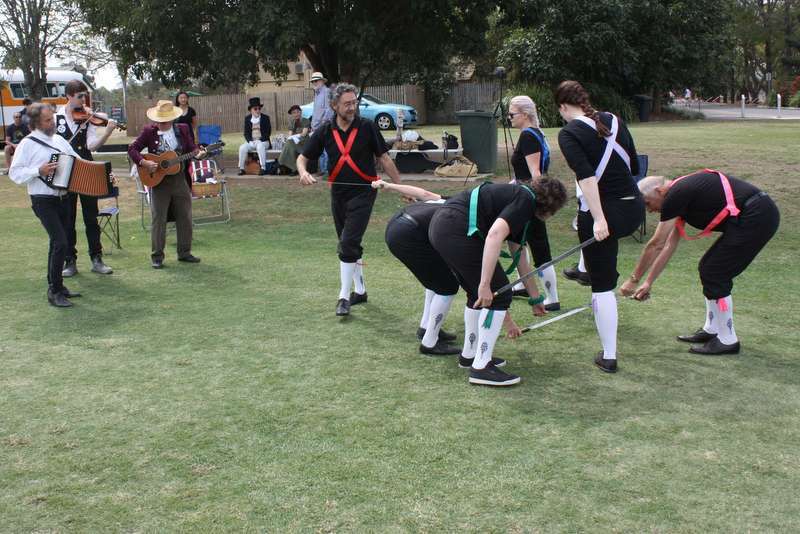 Brisbane Rapper and Sword Side (BRASS) performing English Clogging and Sword - Longsword, Flamborough and Rapper - at the Fox and Hounds. 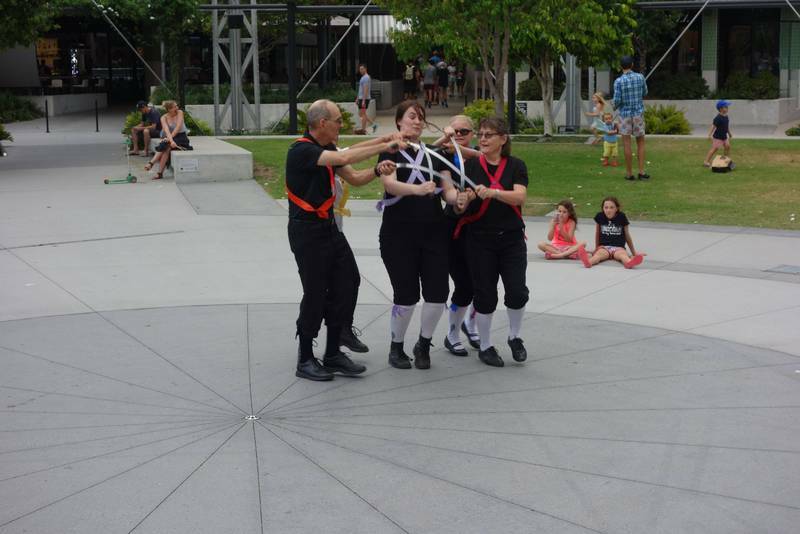 Just for fun BRASS dance out at the Mt Coot-tha Lookout. 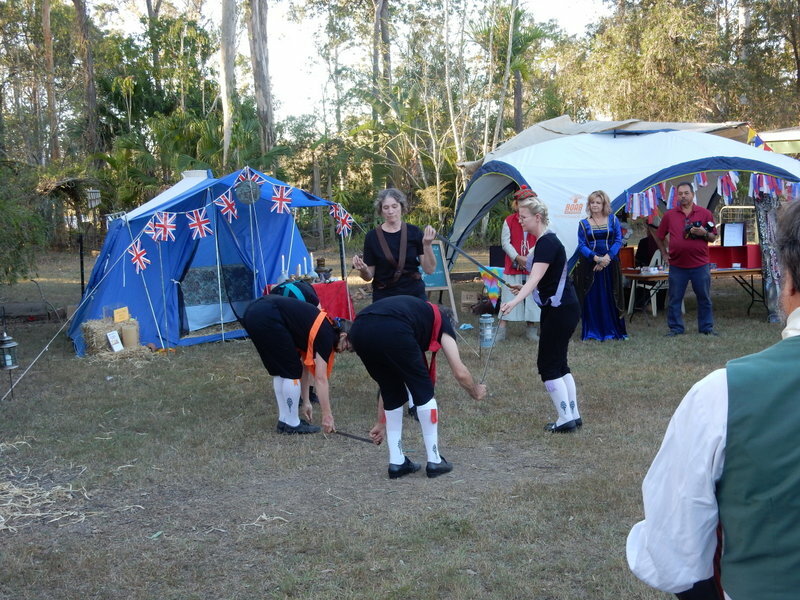 To entertain those around. 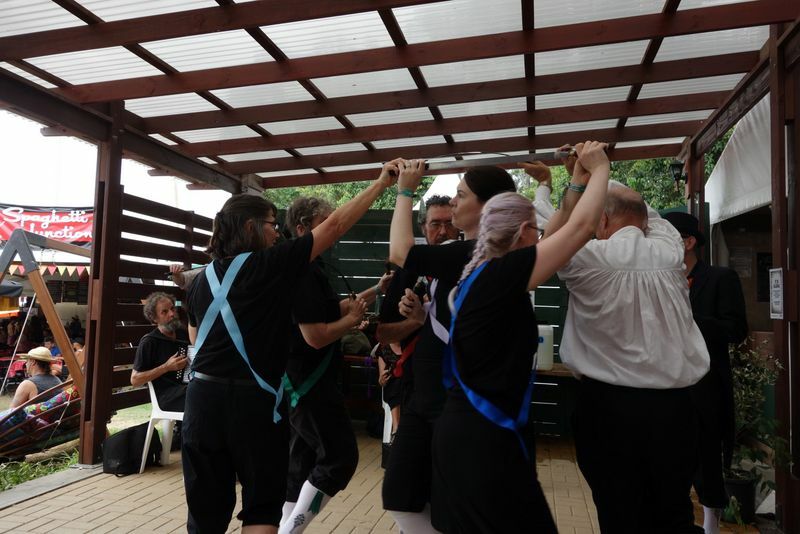 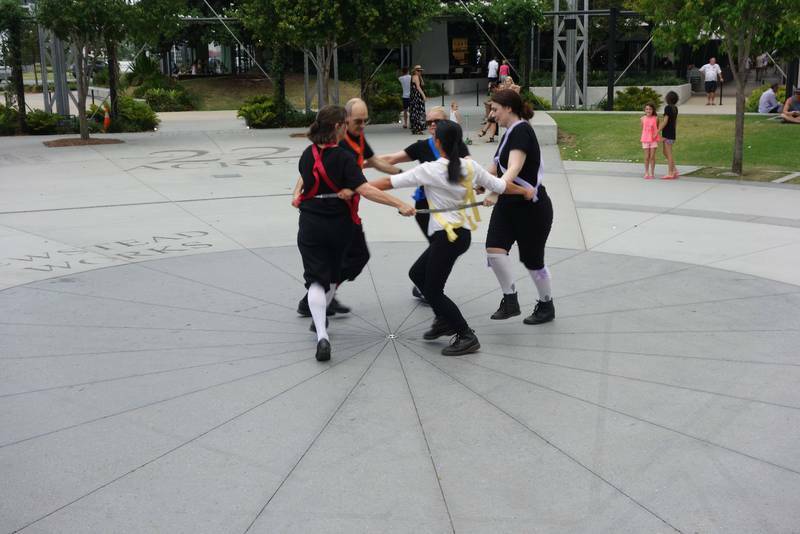 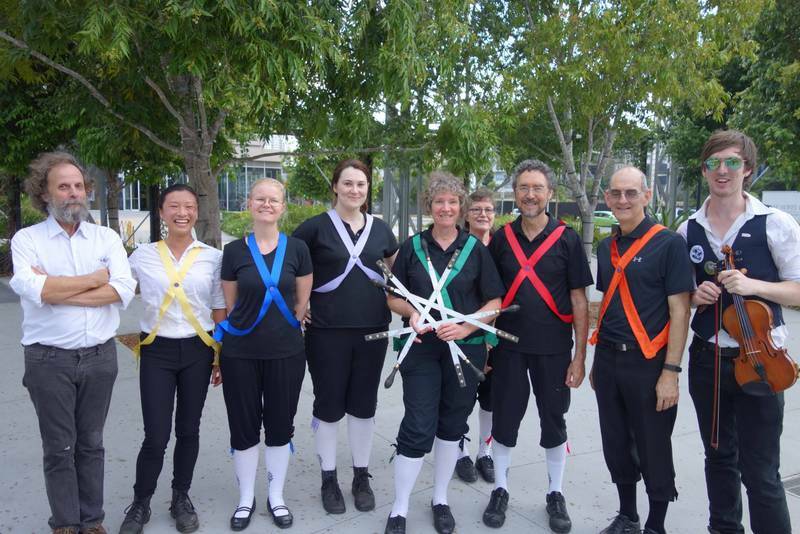 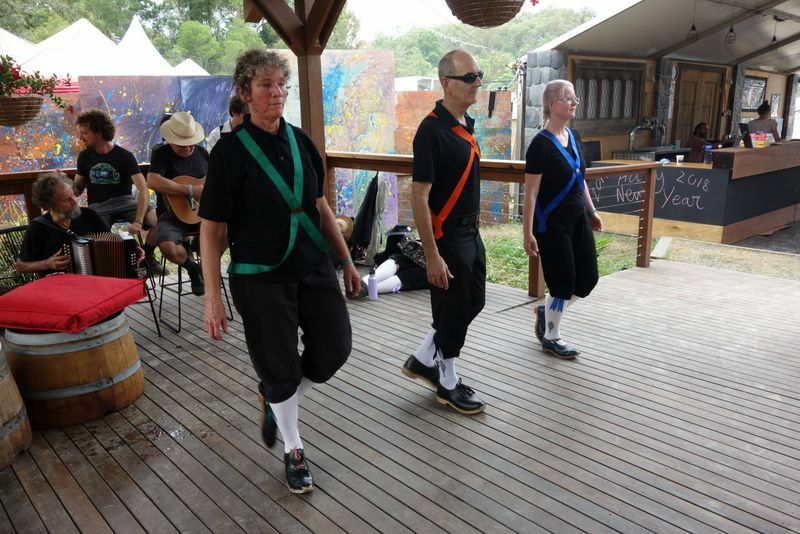 Dance Kaleidoscope and BRASS perform at the Morris Ale - English Step Clogging, Longsword and Rapper Sword Dance. 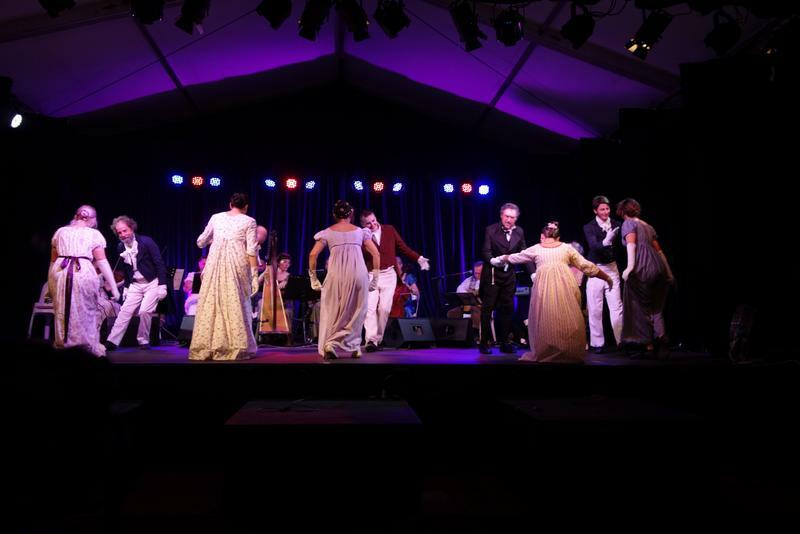 Dance Kaleidoscope holds an Evening Dance to celebrate the life of Jane Austen with the band Sounds Austen under Jonathon Zorzetto. 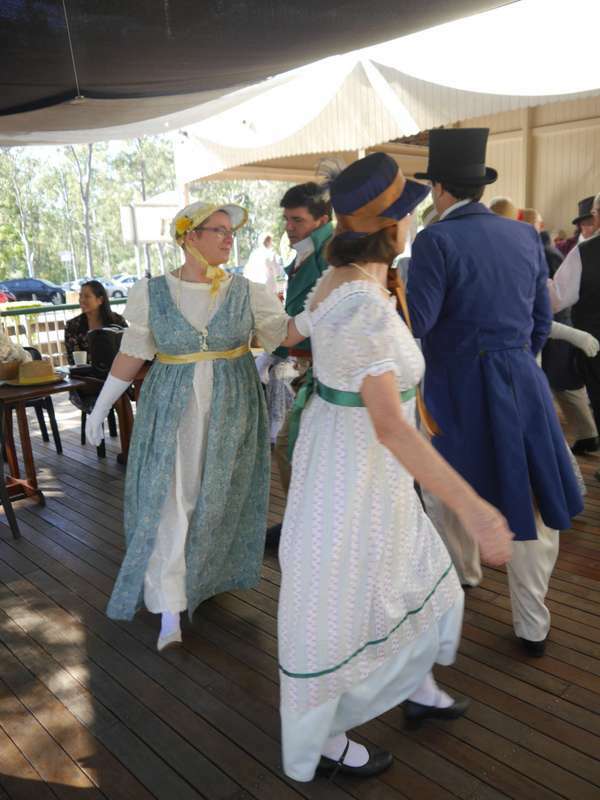 The caller is Sheree Greenhill and the dances are ones which could have been danced by Jane Austen. 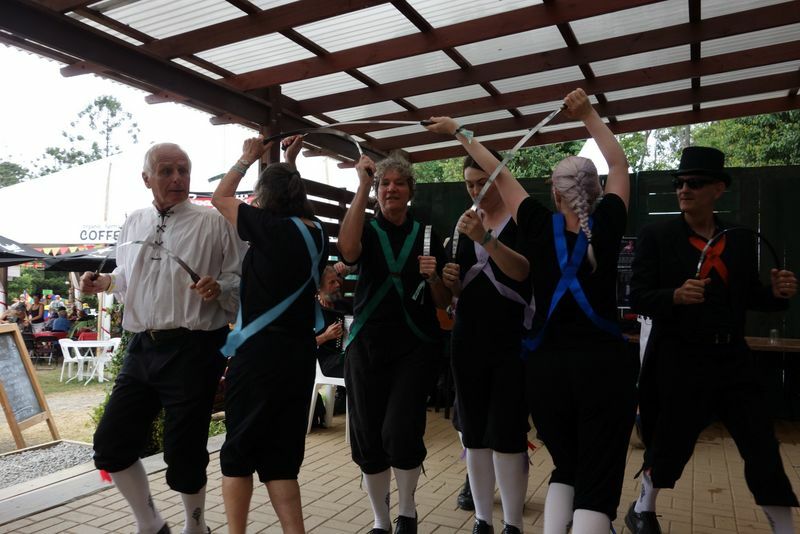 Dance Kaleidoscope performs English Country Dance, Longsword, Rapper and Clogging at The All British Car Club Day, as well as showing off our cars. 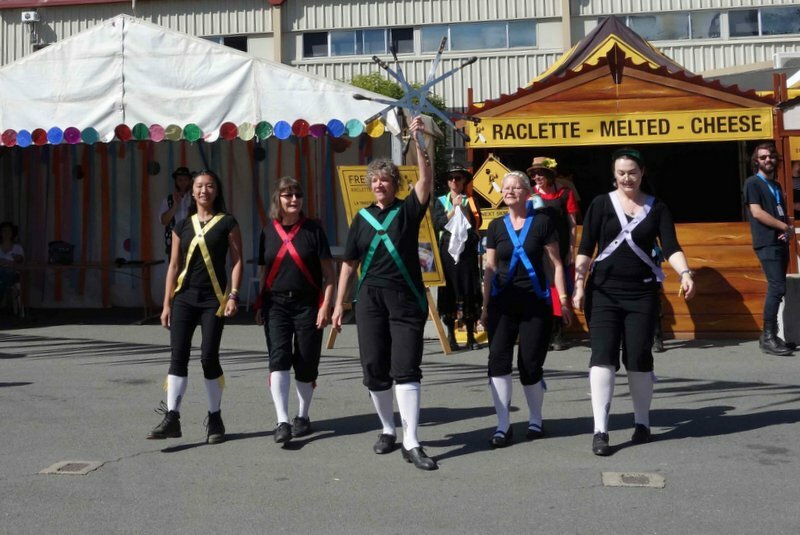 Dance Kaleidoscope show their skill at English Step Clogging, English Longsword and Rapper. 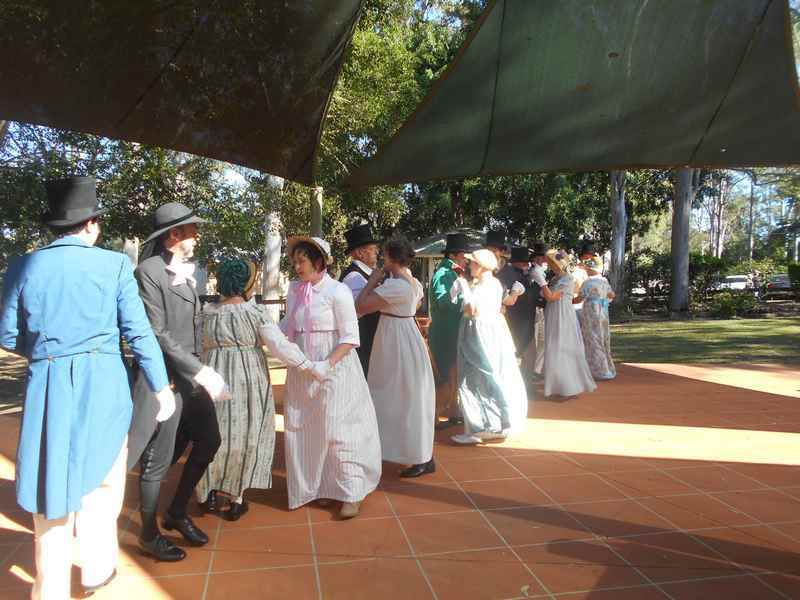 Sheree Greenhill leads the workshop and the Dance out at Picnic at Pemberley at The Abbey Museum Caboulture. 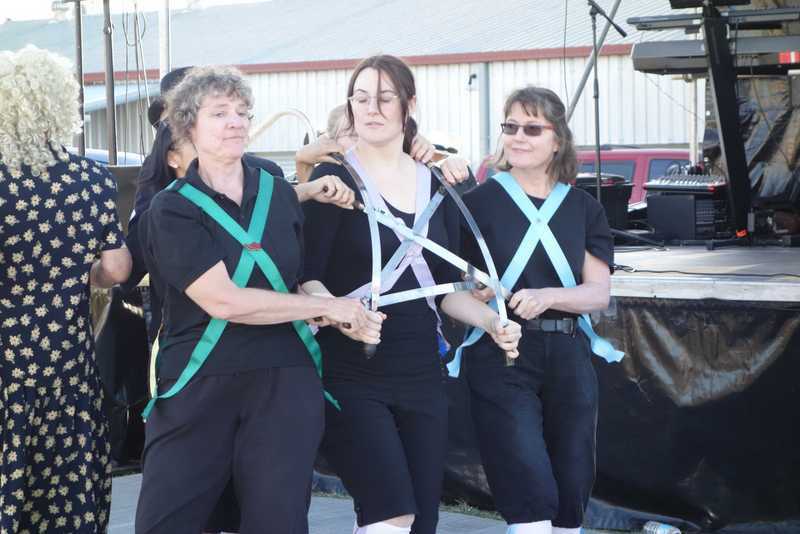 Dance Kaleidoscope presented a few dances before getting the public involved. 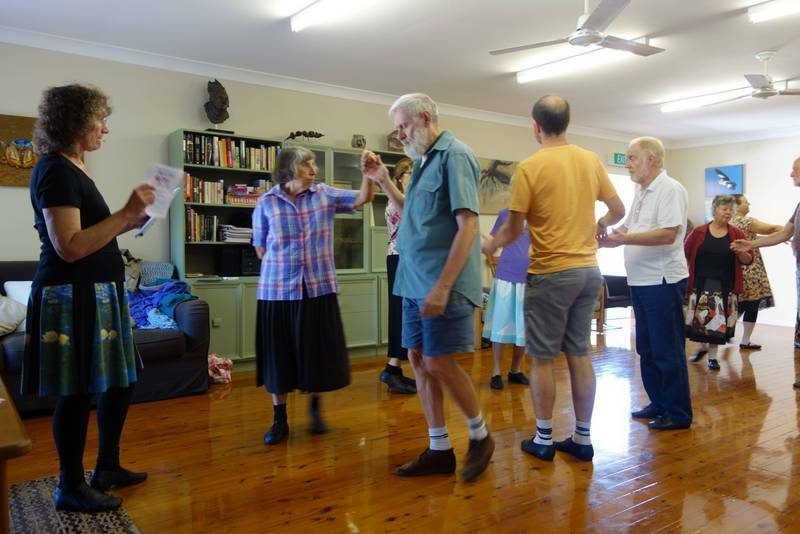 A day of dances by Pat Shaw. 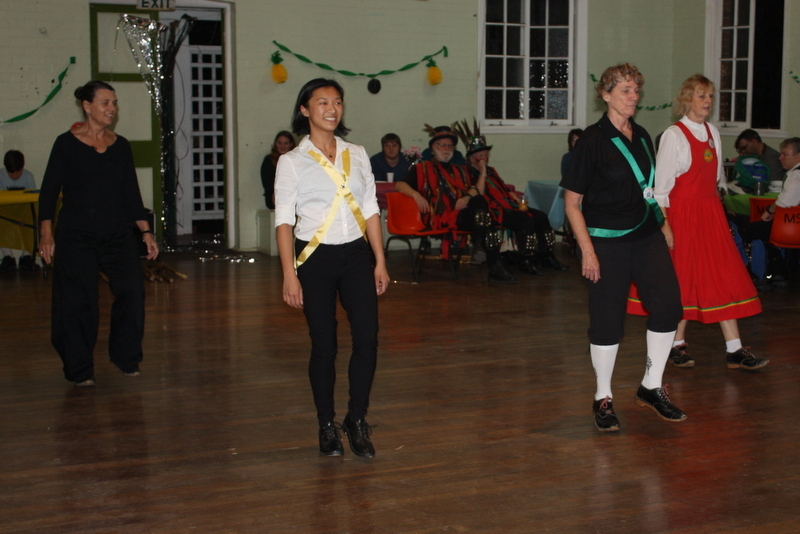 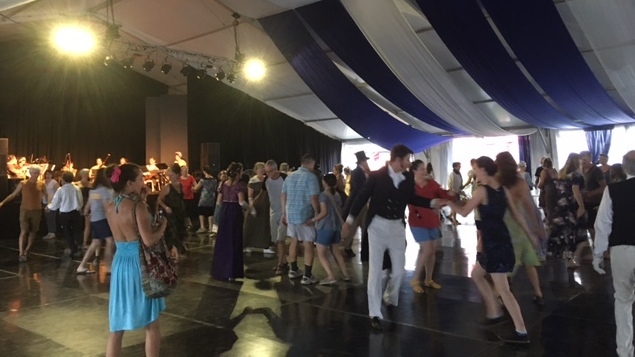 English Country Dancing and Clogging while the Pennyfarthings whirl by. 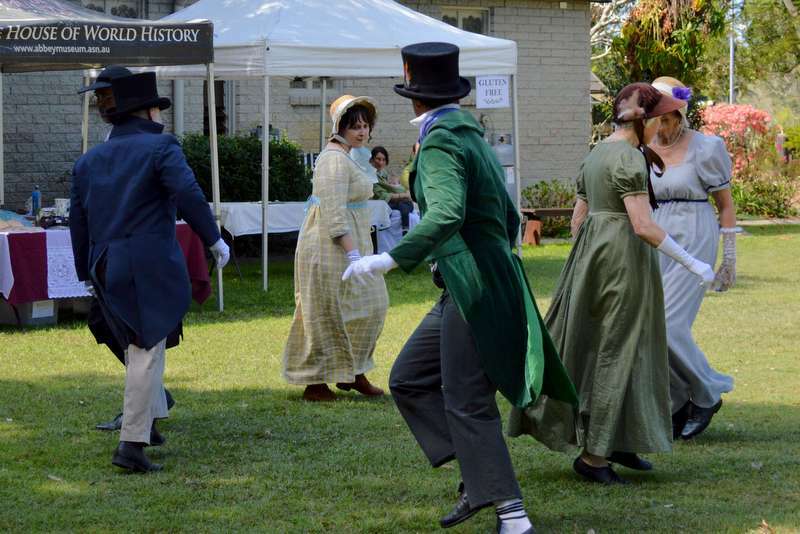 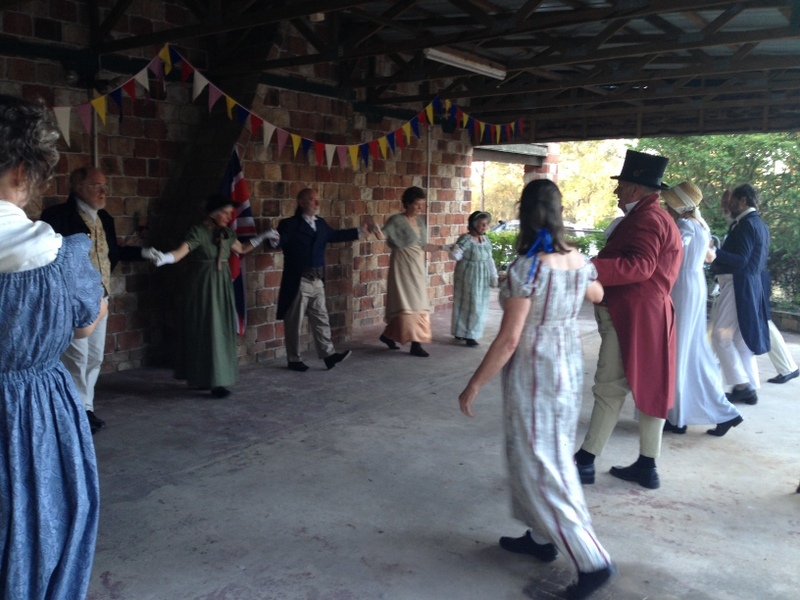 Dance Kaleidoscope entertains in 18th Century style and we teach the locals how to dance at History Alive. 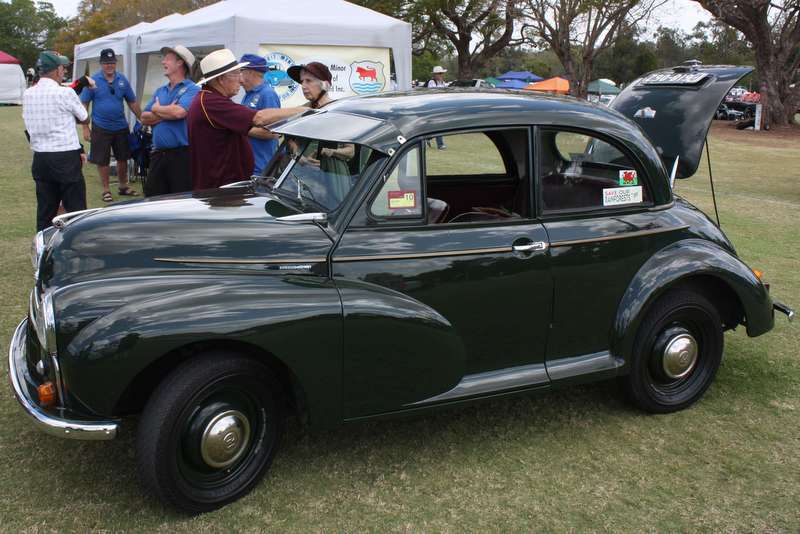 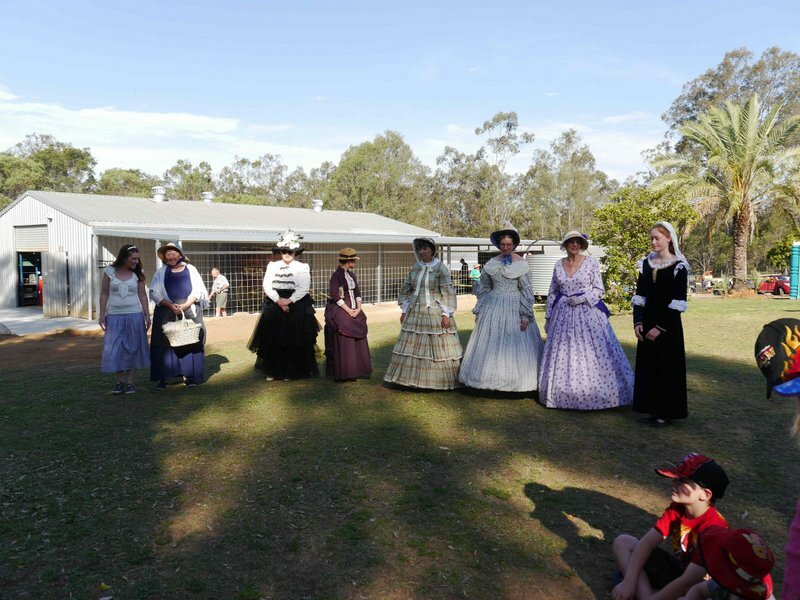 Steam Day at Old Petrie Town. 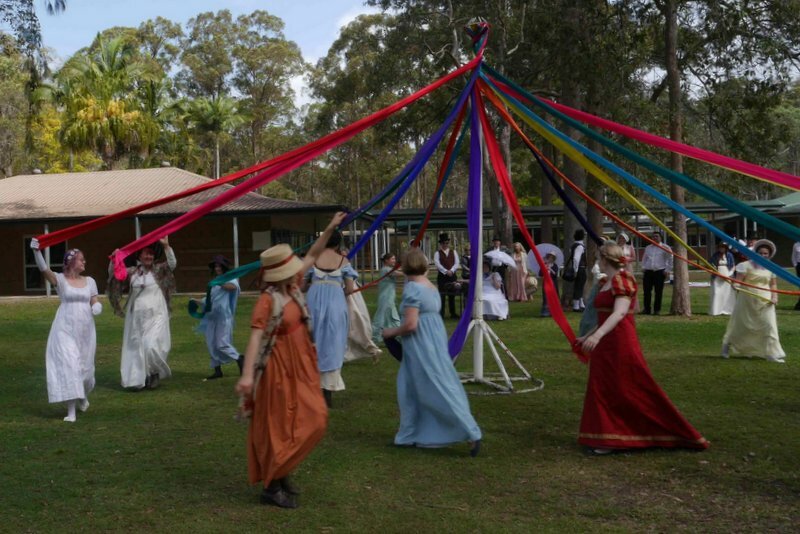 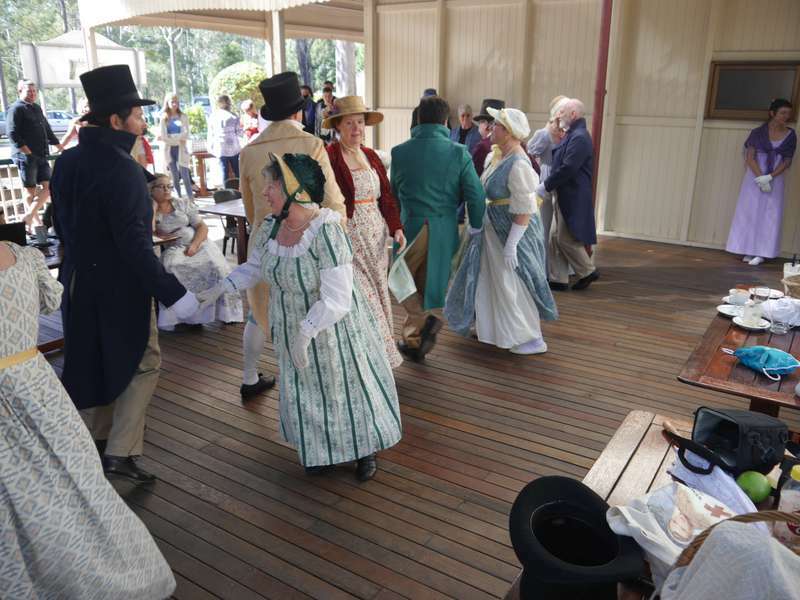 A dancing display on the verandah at Old Petrie Town. 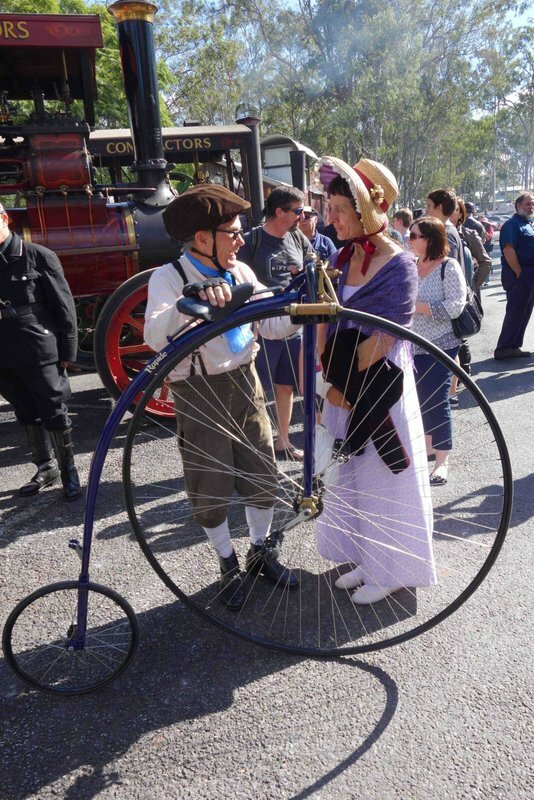 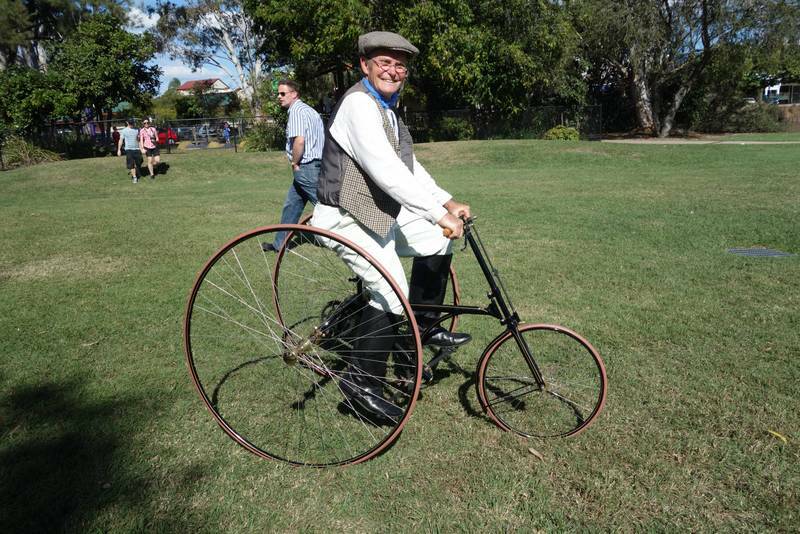 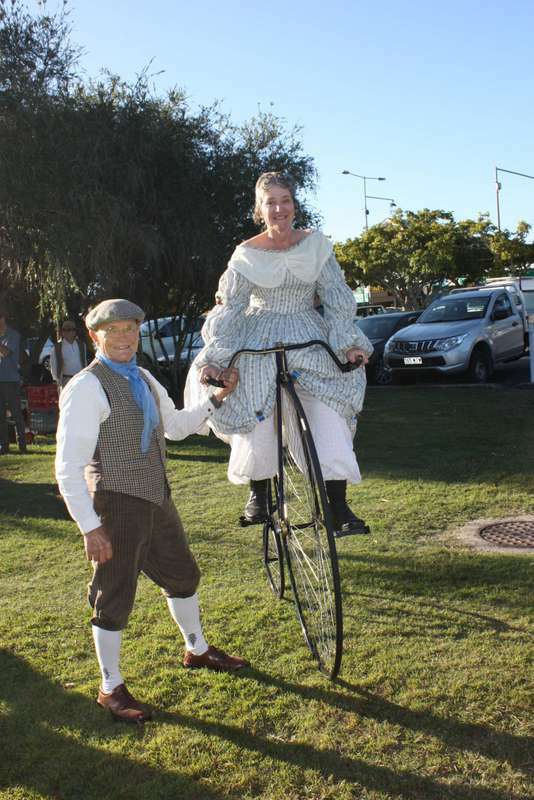 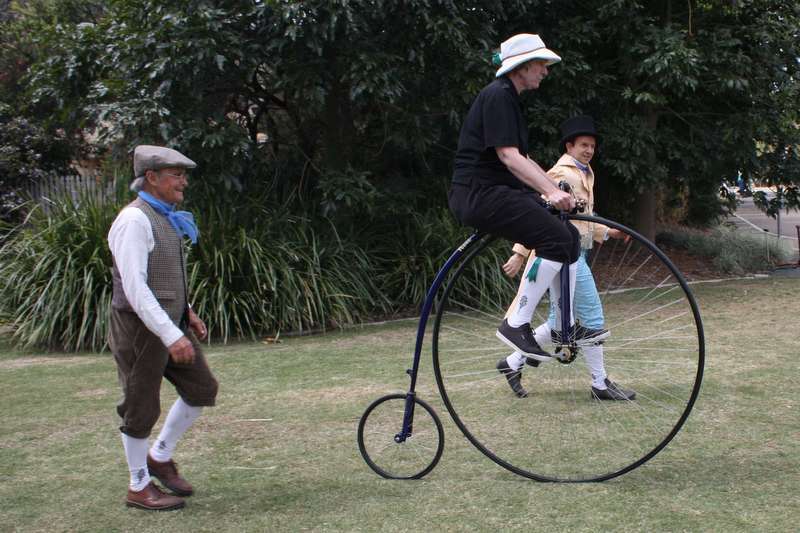 That Pennyfarthing again. 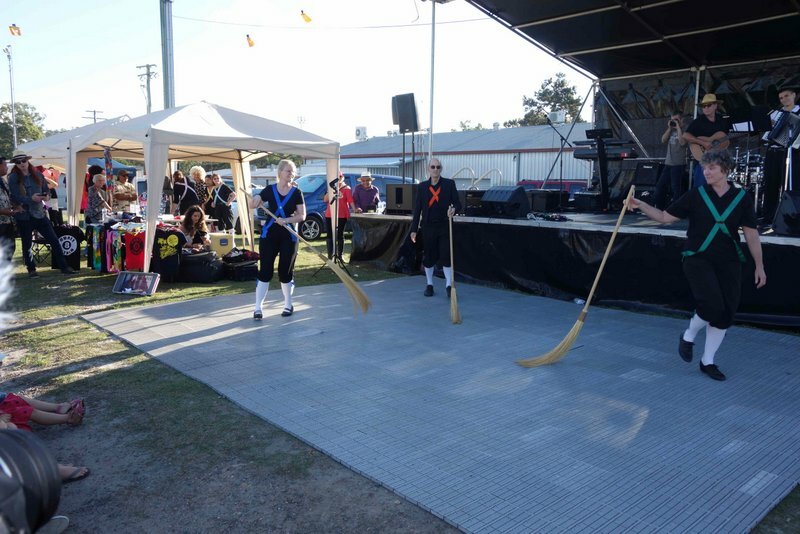 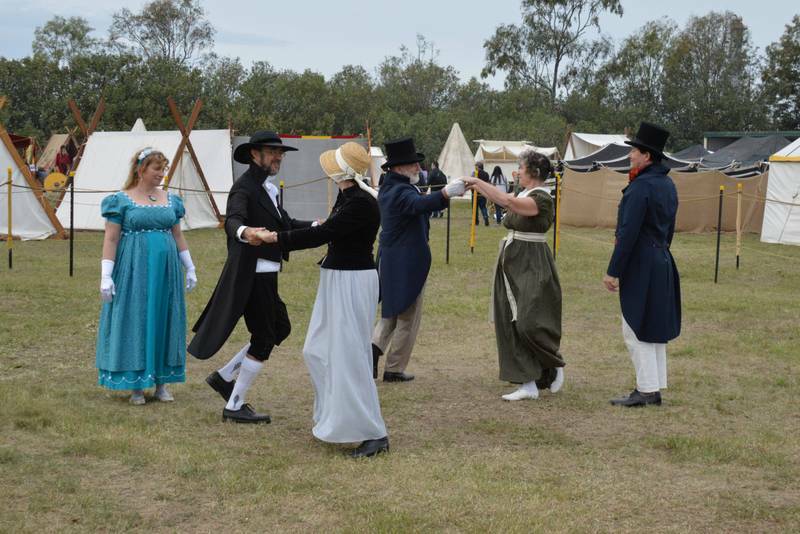 Sword and Broom Dance at a small festival at Beenleigh. 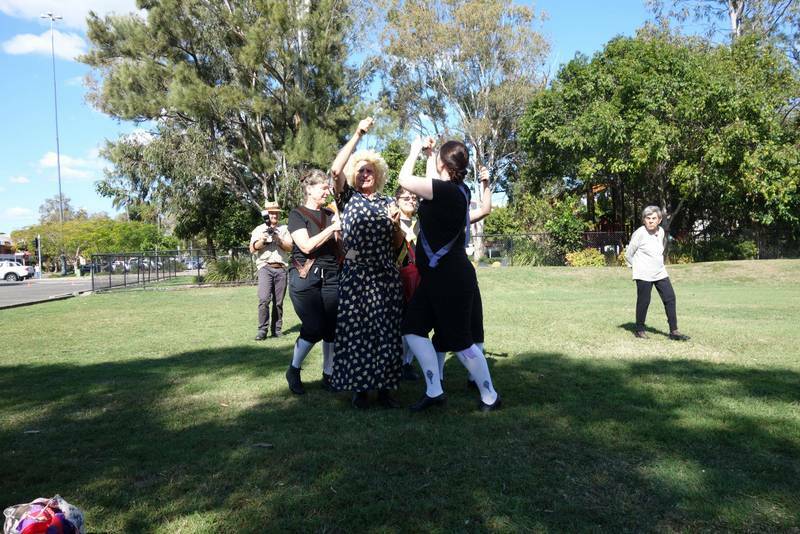 BRASS Dance Up the Sun on Mt Cootha. 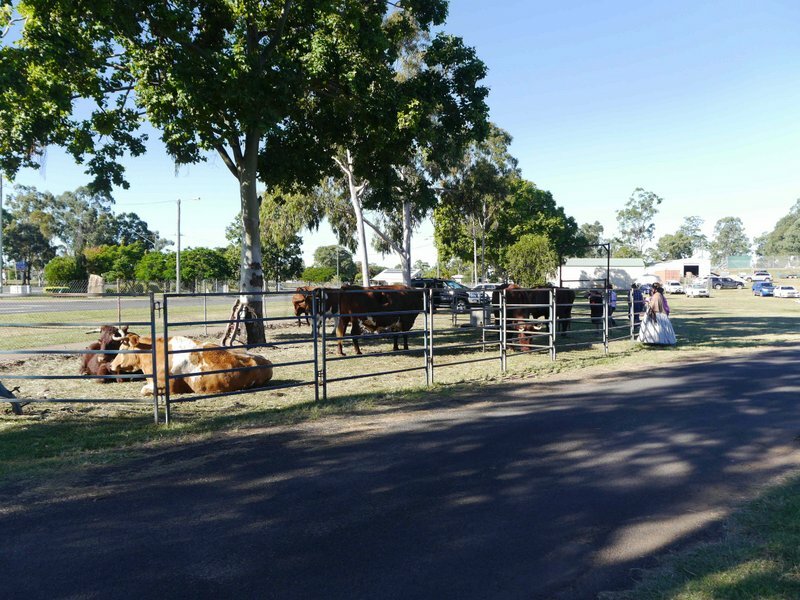 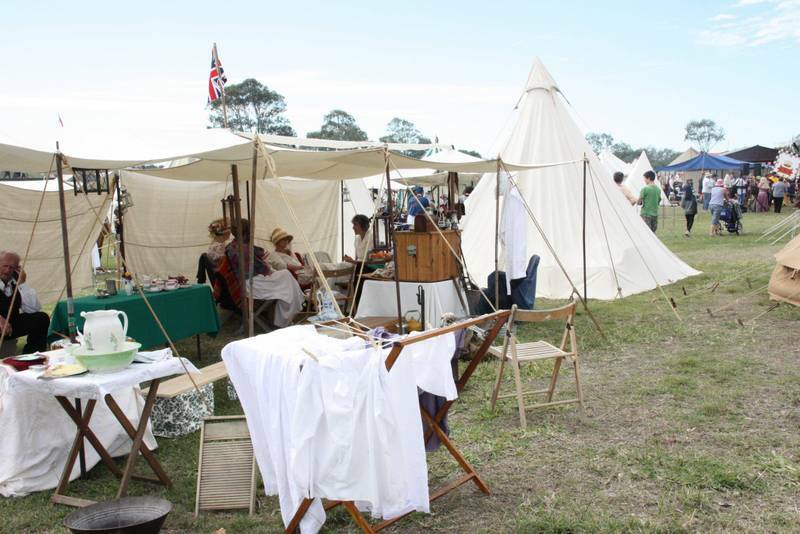 Heavy Horse Day at Gatton Showground. 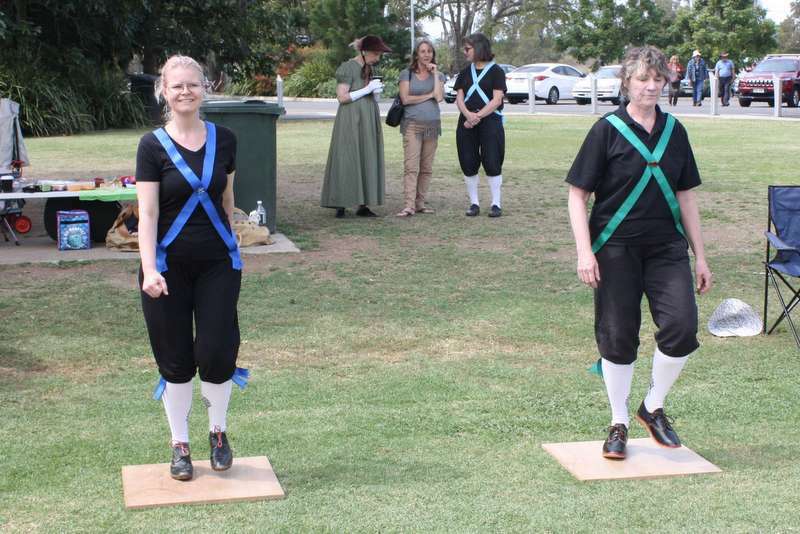 Dressed in our Colonial finest we show off our dancing and lead the parade around the ring. 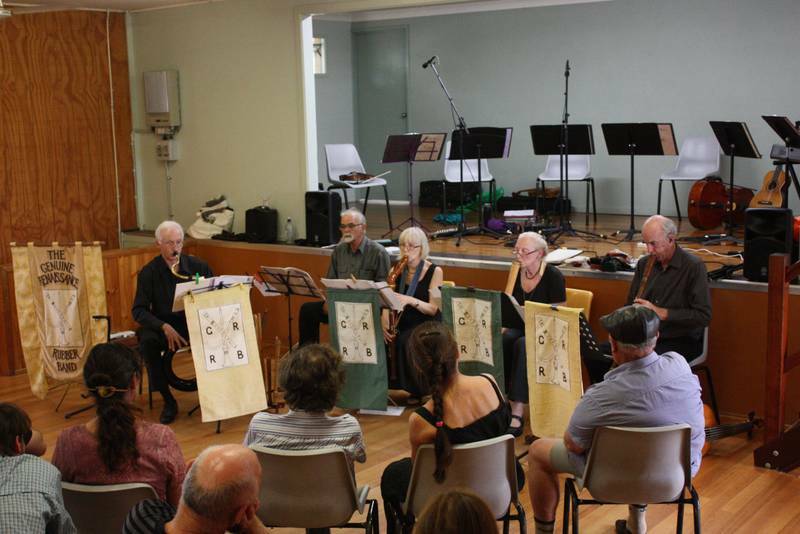 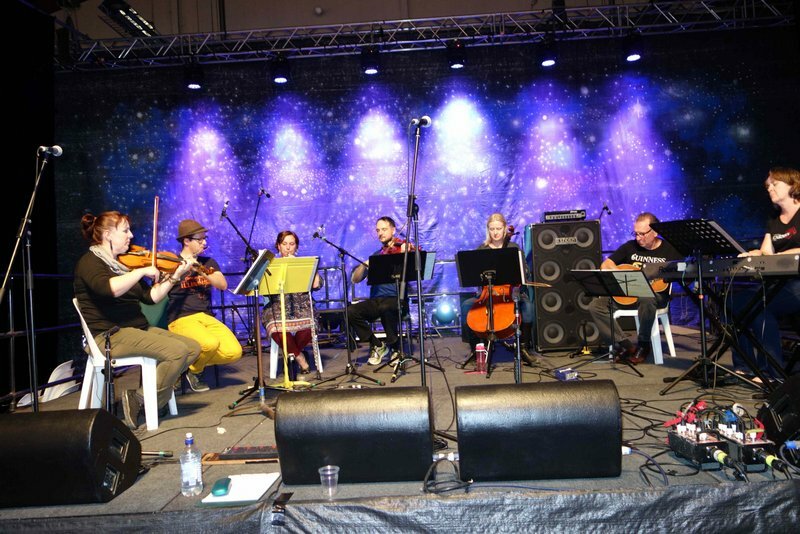 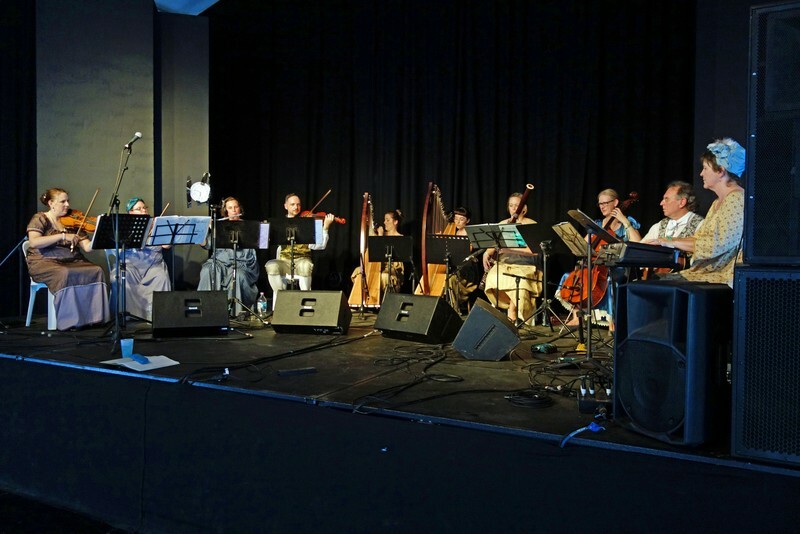 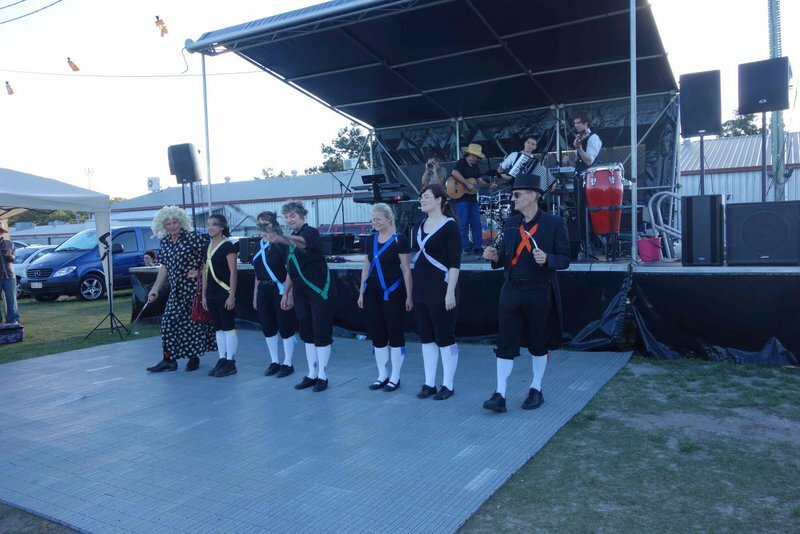 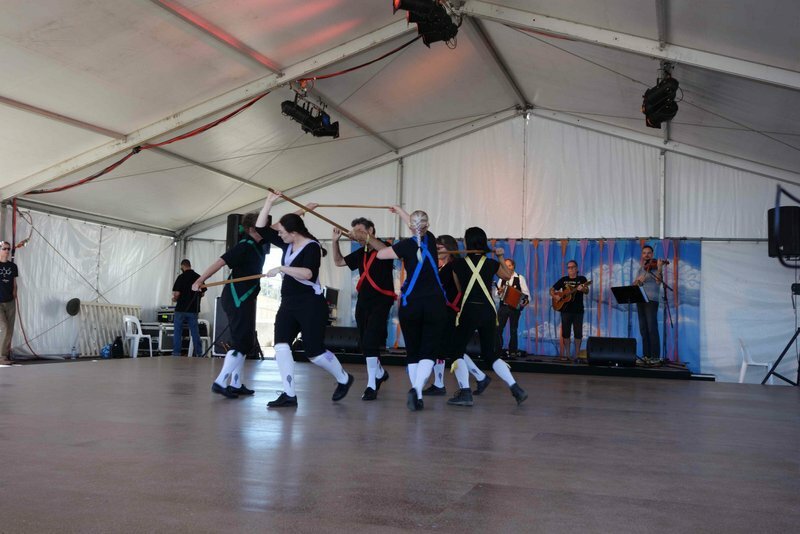 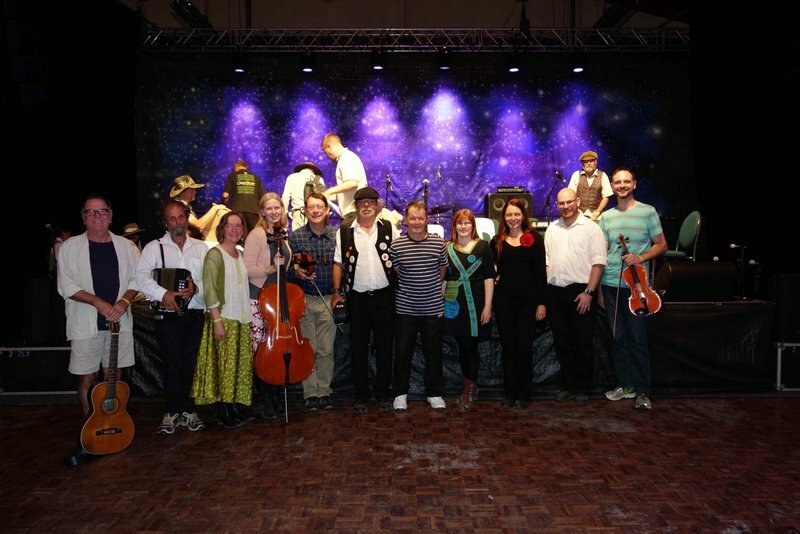 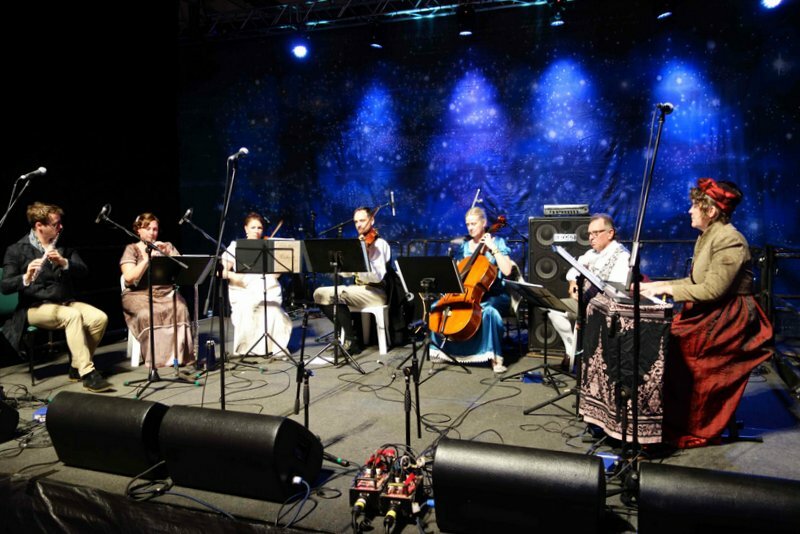 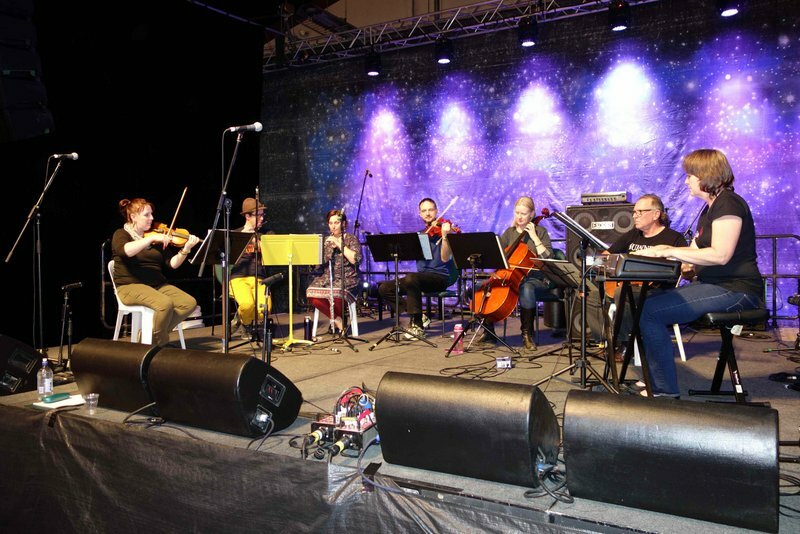 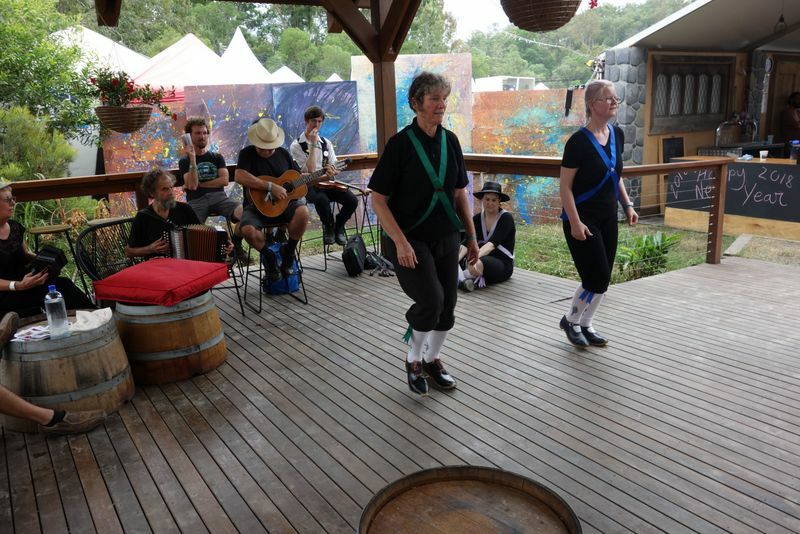 Dance Kaleidoscope presented a varied program at the National Folk Festival. 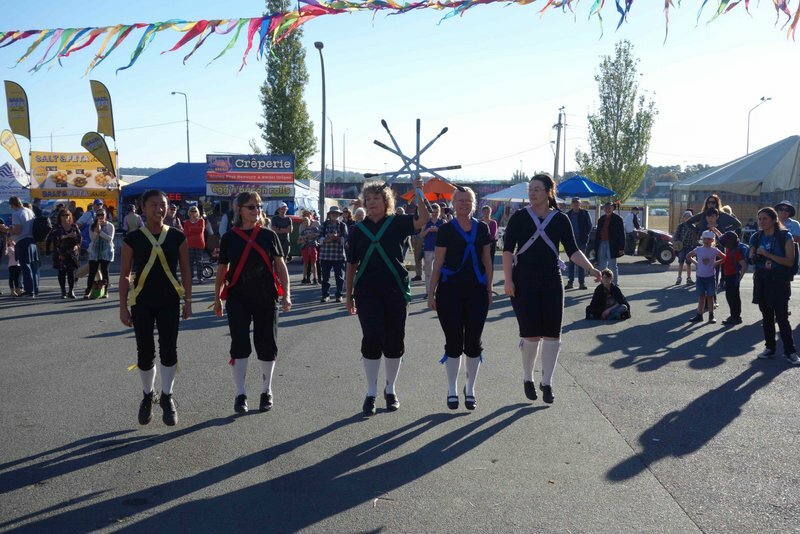 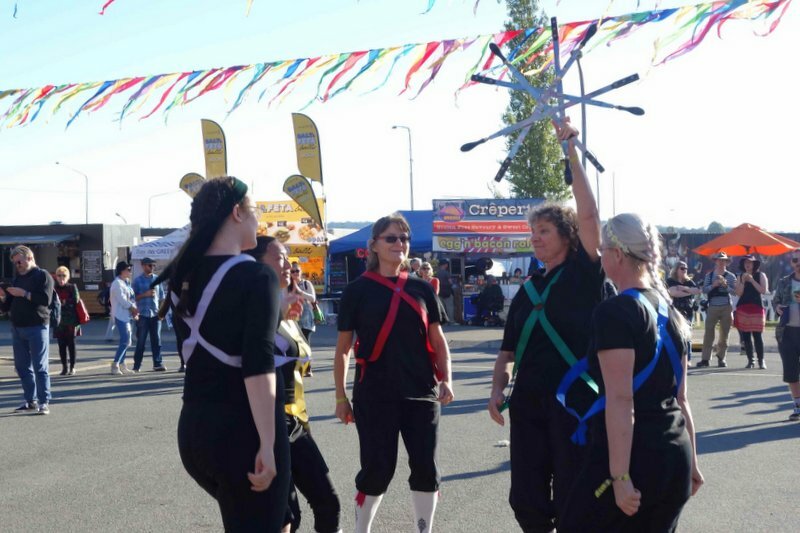 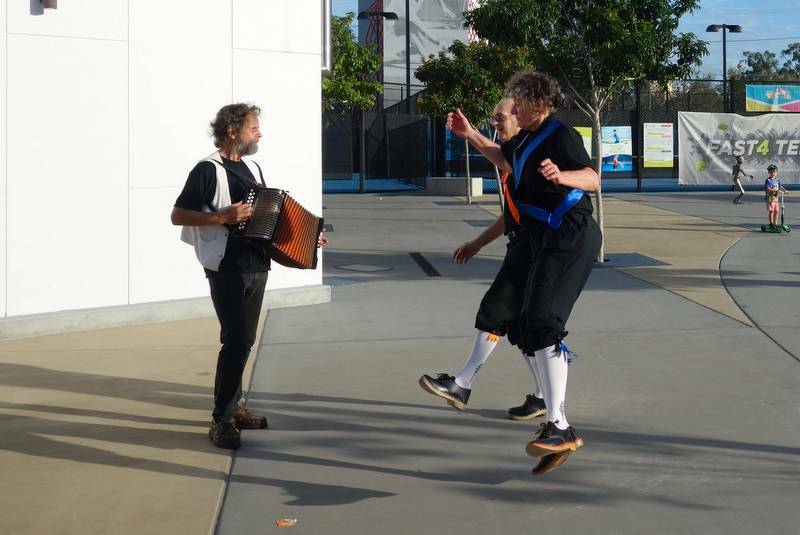 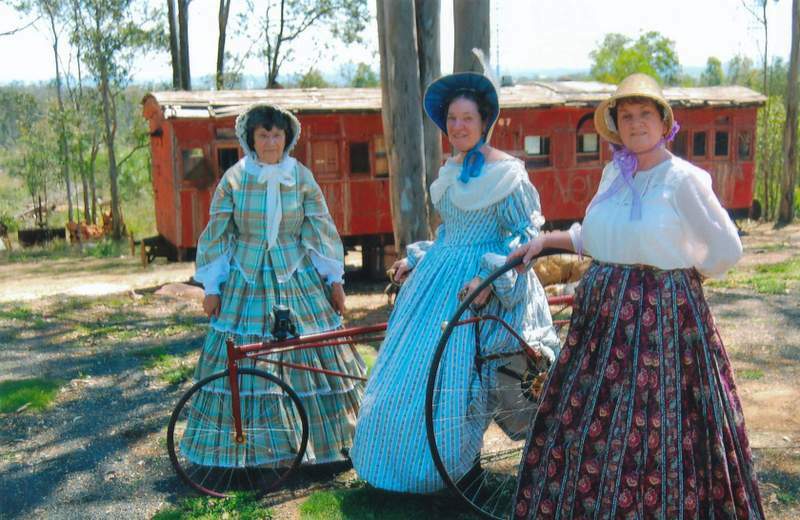 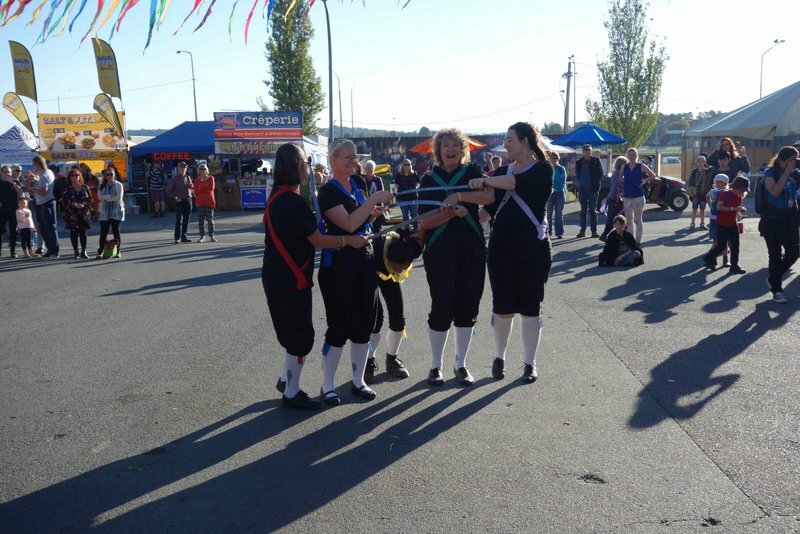 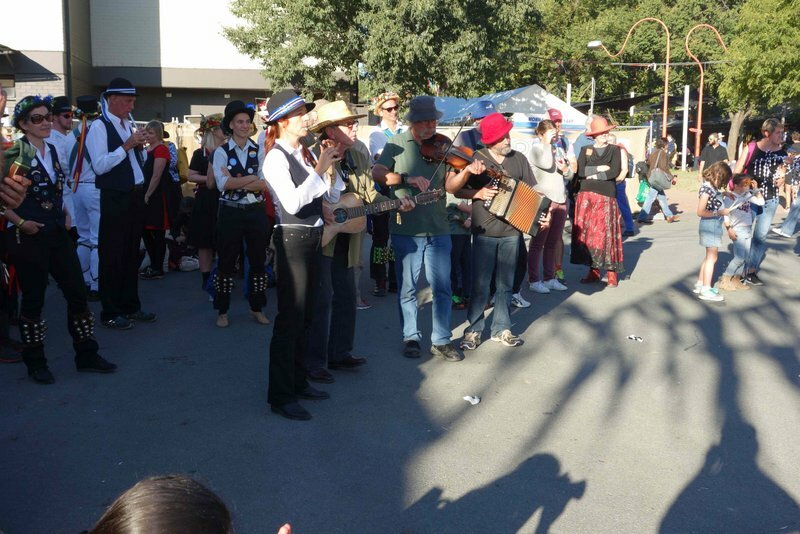 They held Sword workshops, a Tea Dance, a Contra dance, and street dances. 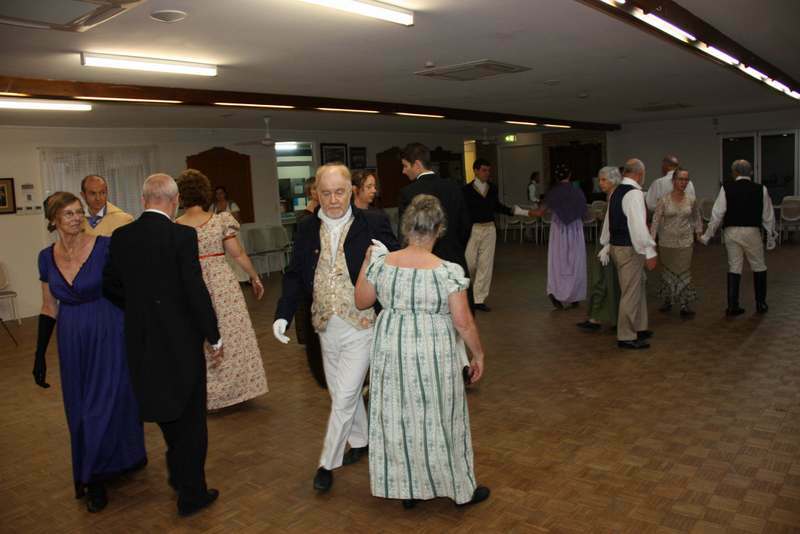 Regency Tea Dance Wokshop with Sounds Austen. 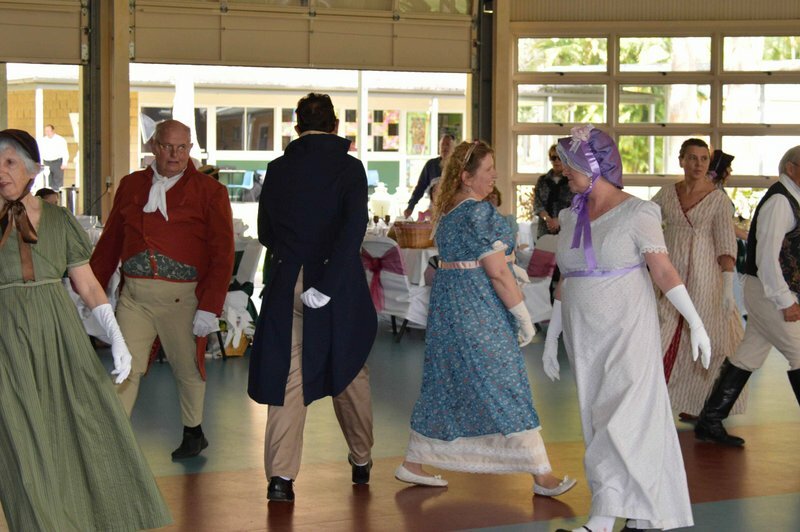 Regency Tea Dance with Sounds Austen. 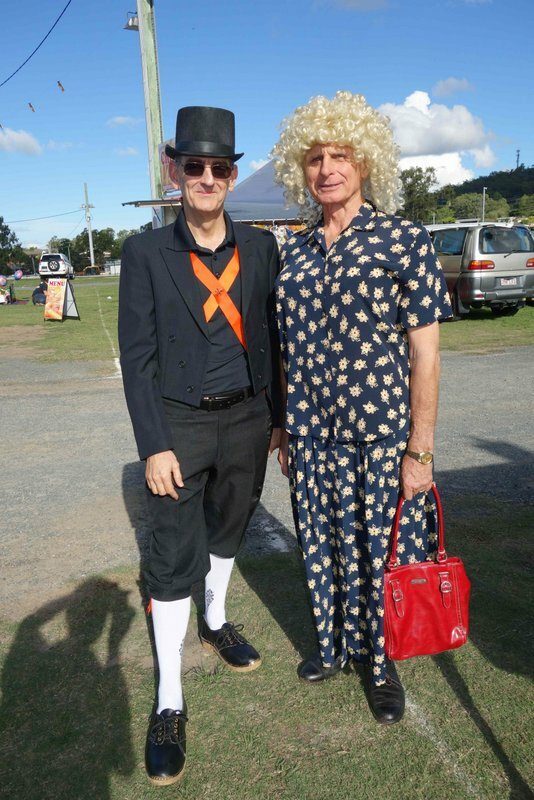 Some are all dressed up. 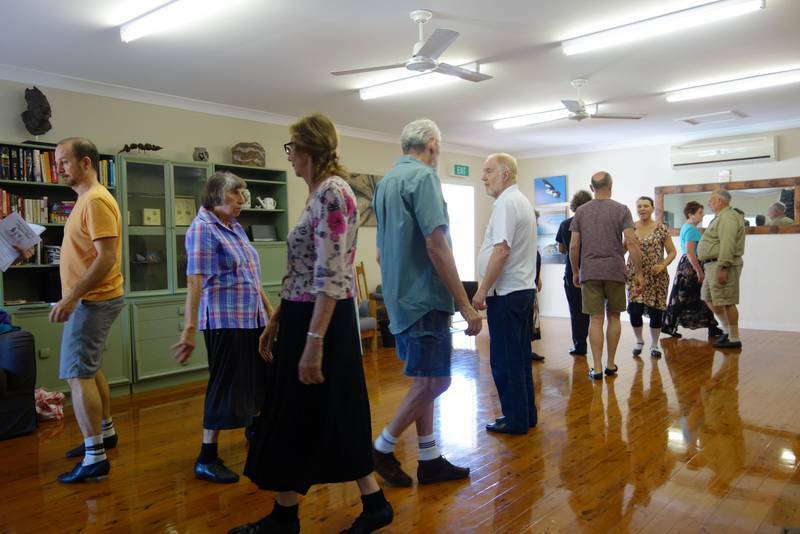 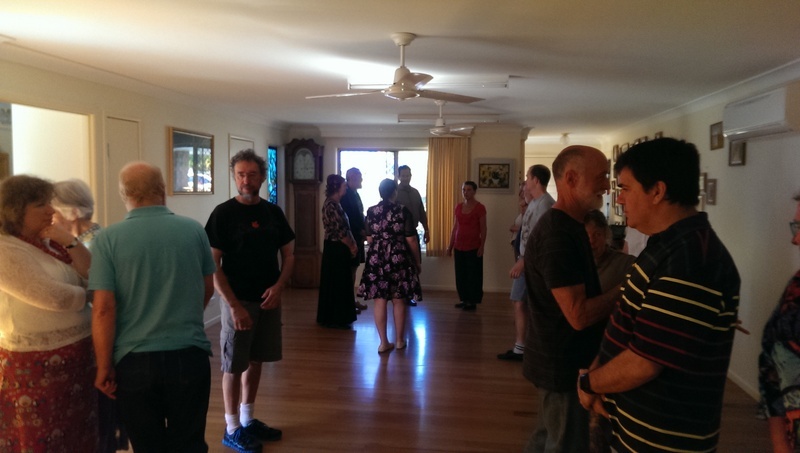 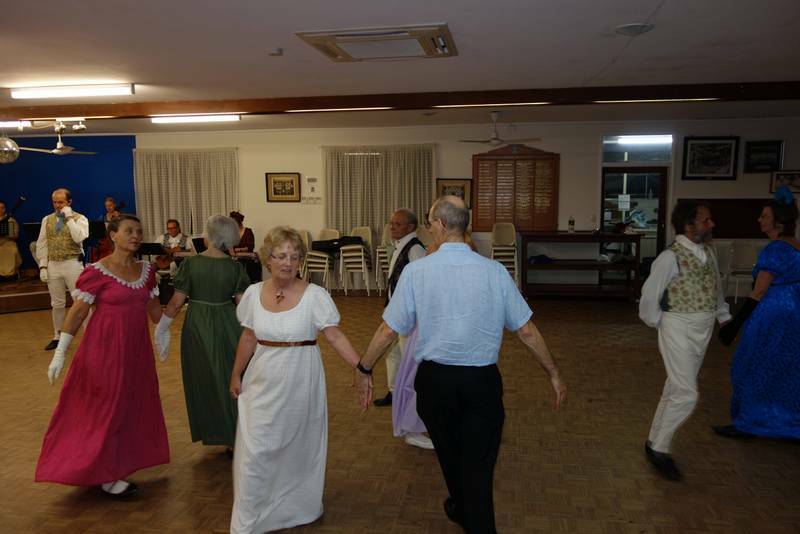 The Ron Coxall Dance Weekend in Adelaide. 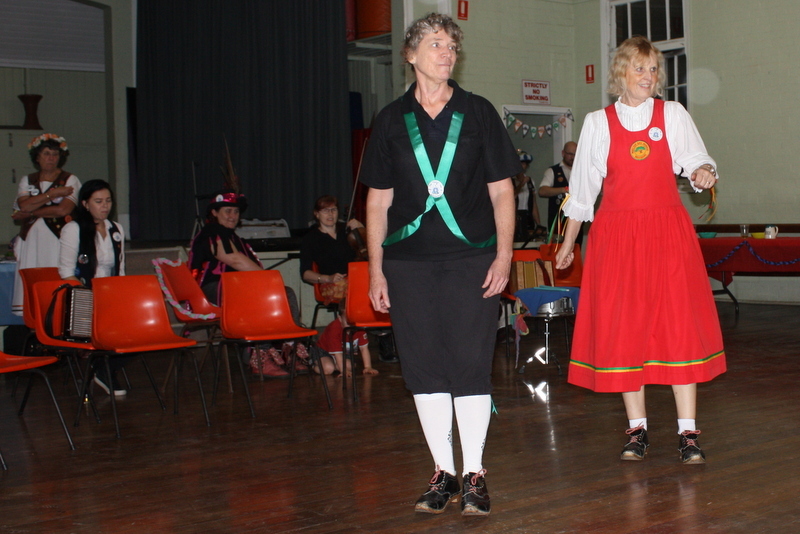 Ron leads a weekend of dances old and new. 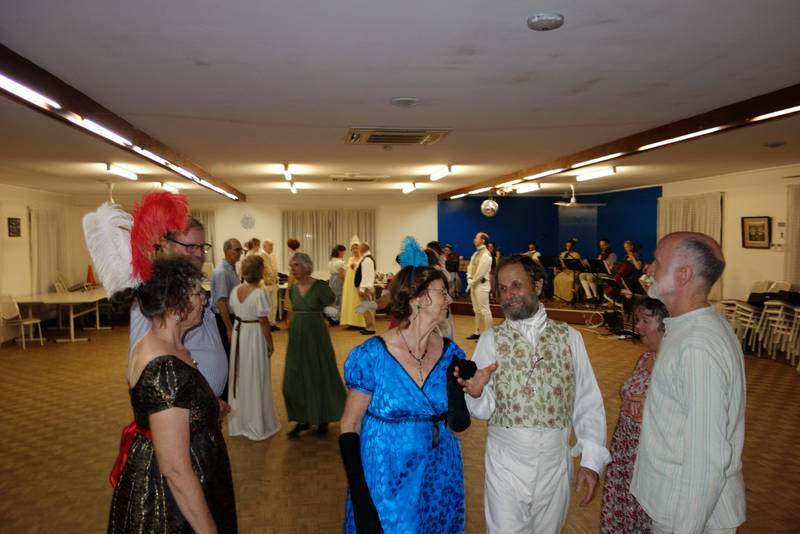 Evening Contra Dance. 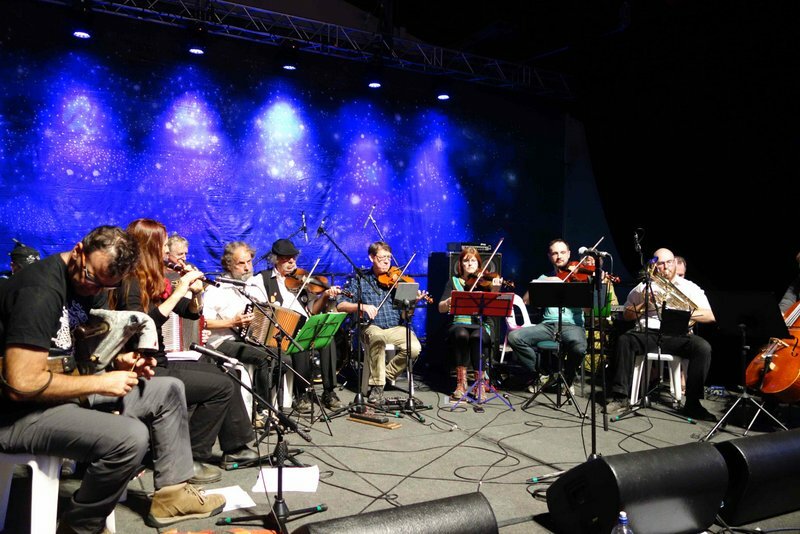 Band lead by Paul Barber-Riley and Alan Craig, caller Sheree Greenhill. 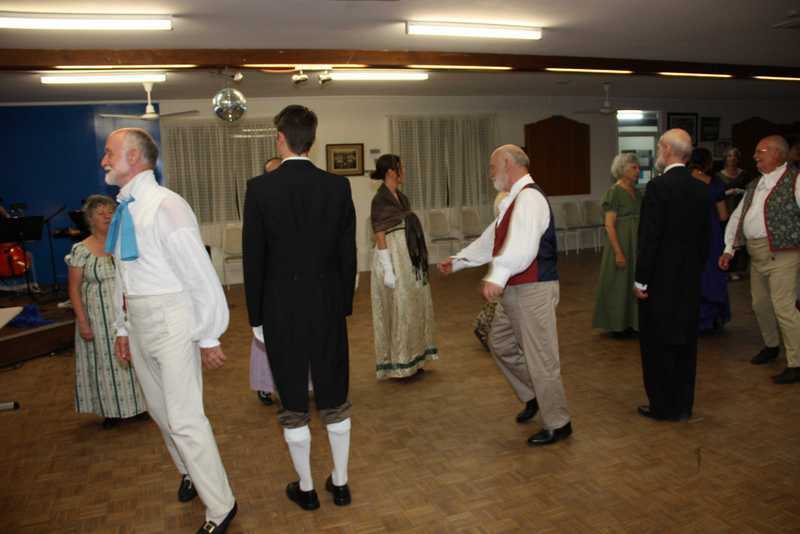 January Dance with Sounds Austen. 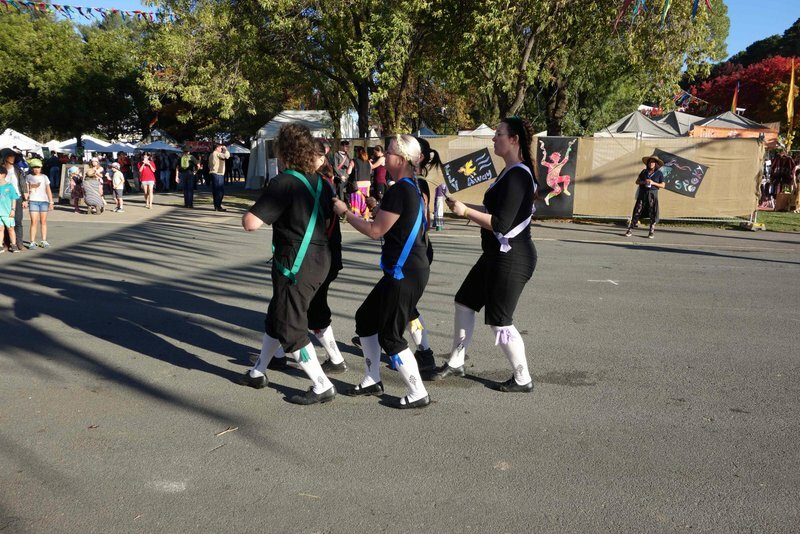 BRASS performing Sword, Clogging, and Broom on the streets and in the Pub at the Woodford Folk Festival. 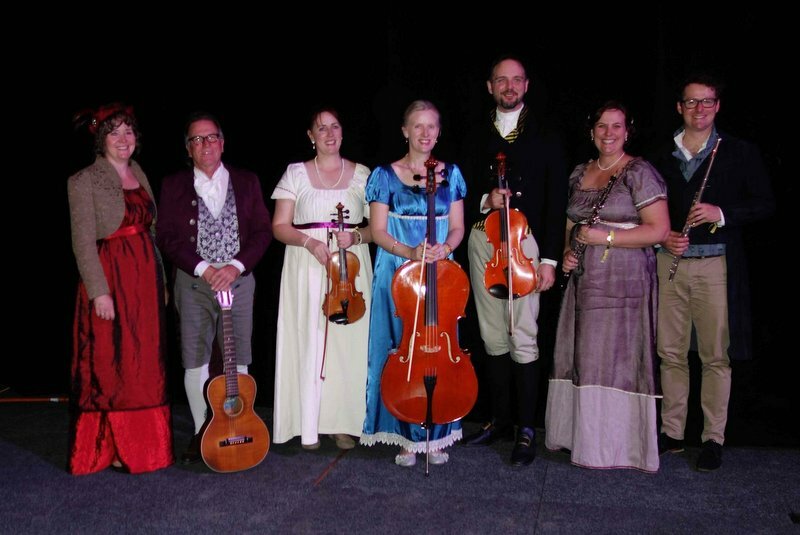 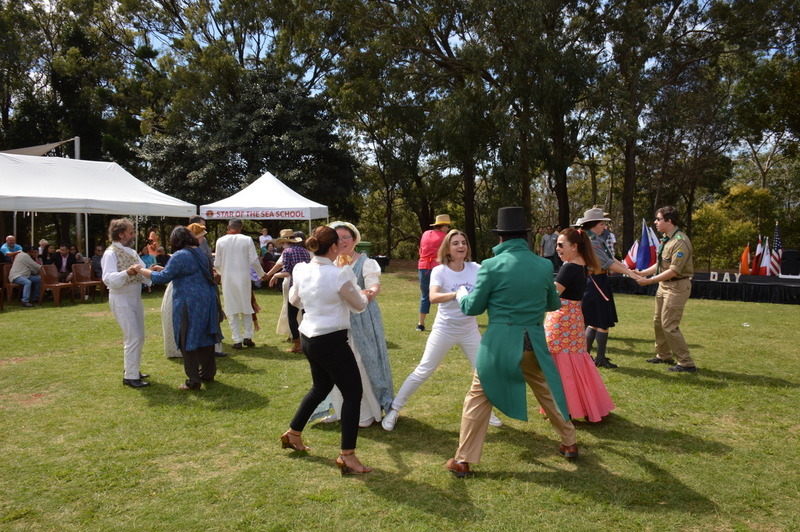 Dance Kaleidoscope perform English Country Dances Old and New to the music of Sounds Austen and The Renaissance Rubber Band who perfom on Original instruments. 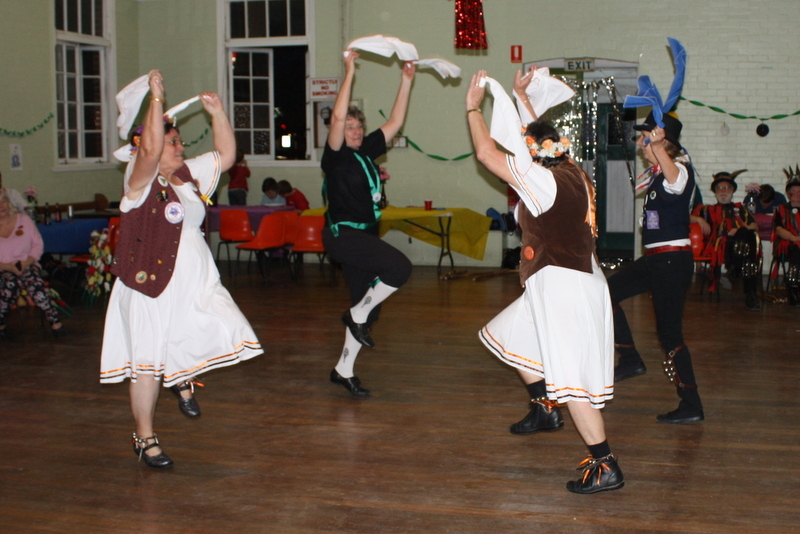 Dance Kaleidoscope danced Sword at the Morris Xmas Party. 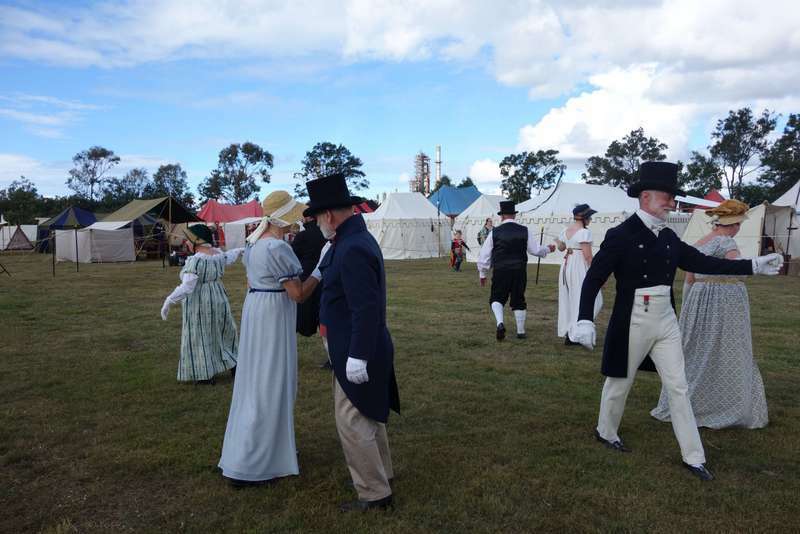 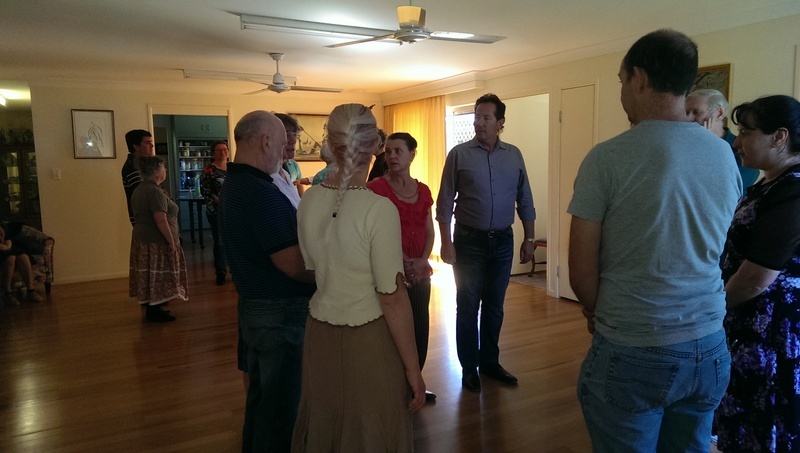 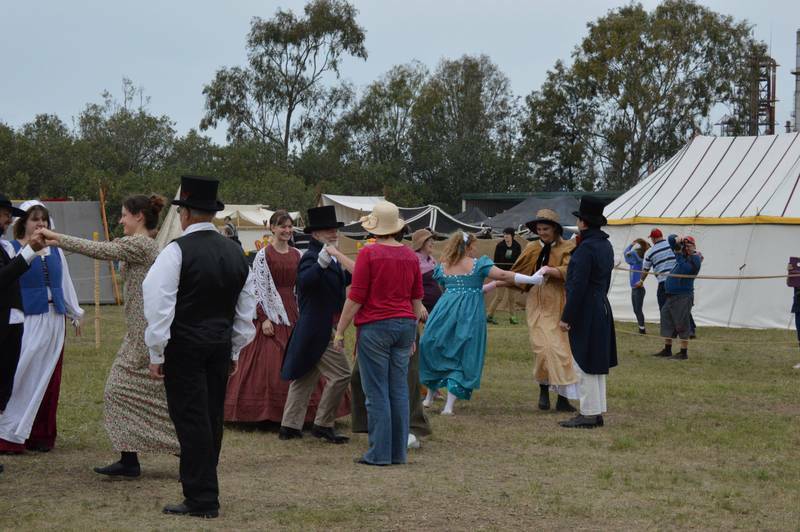 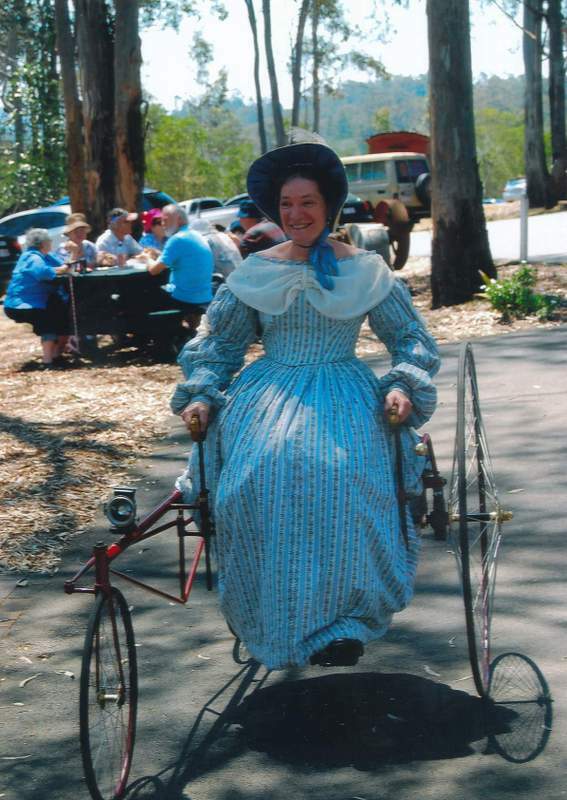 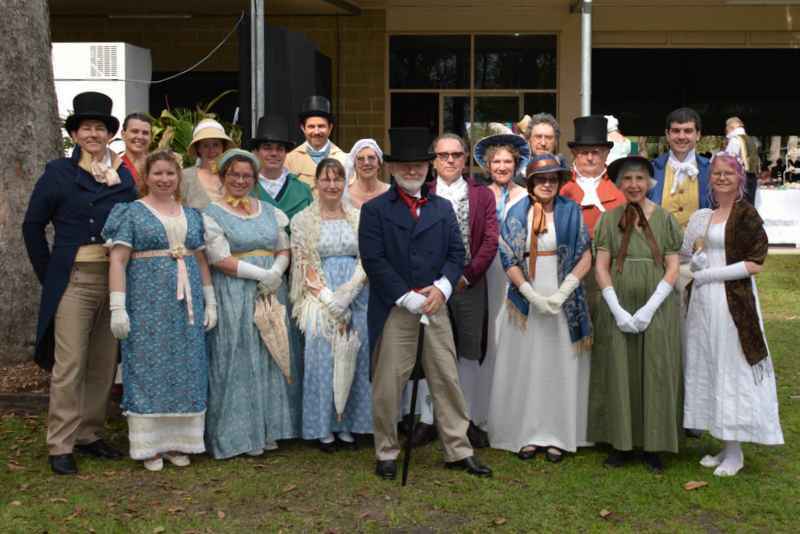 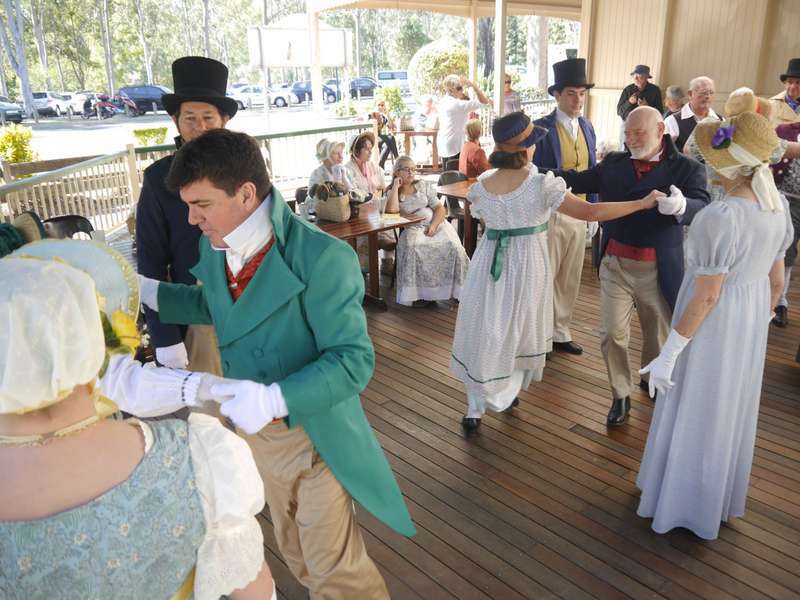 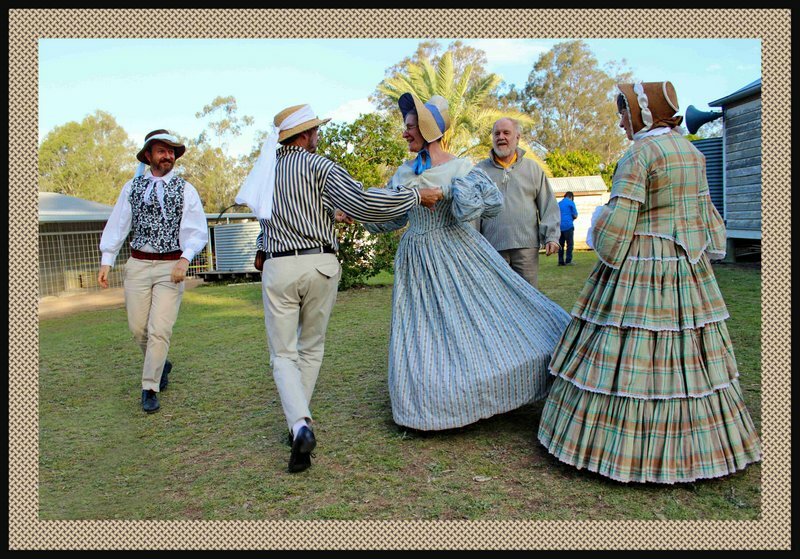 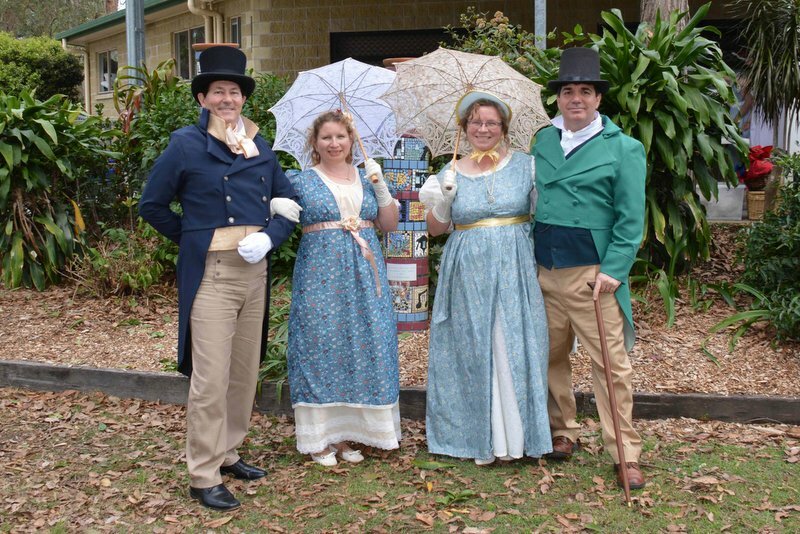 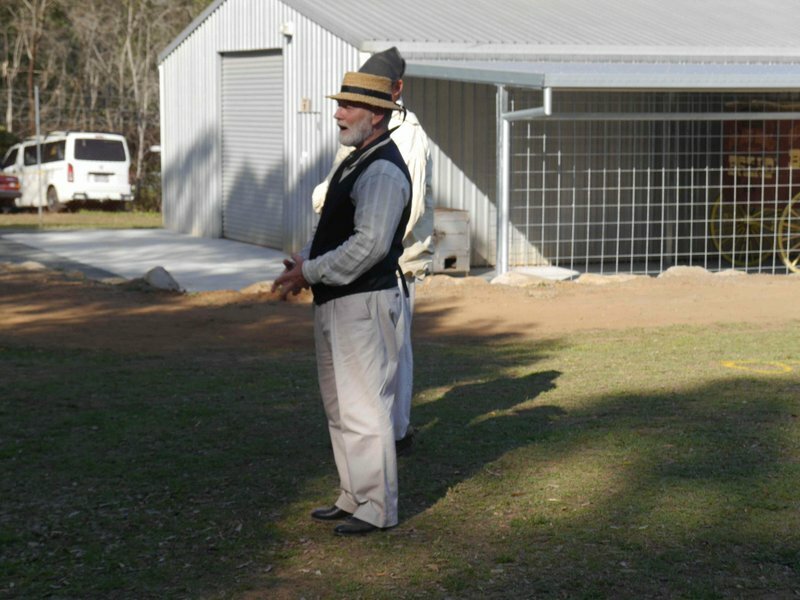 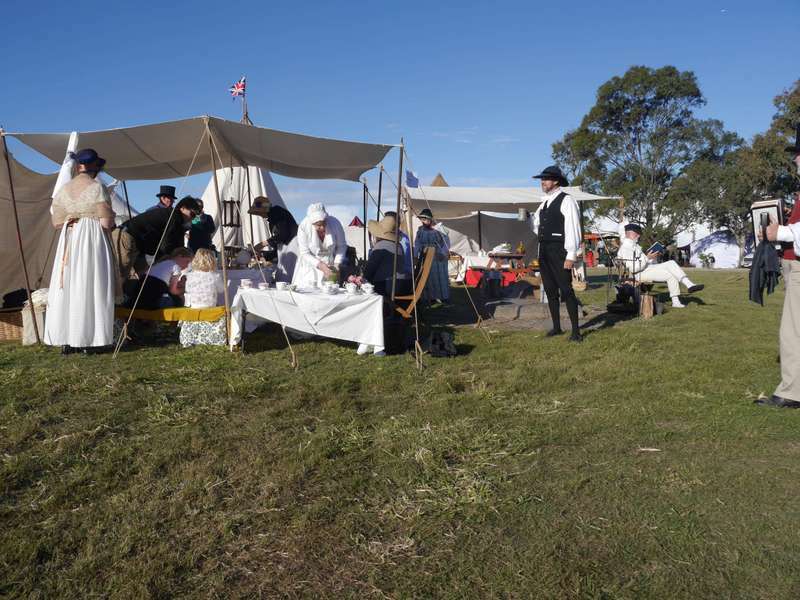 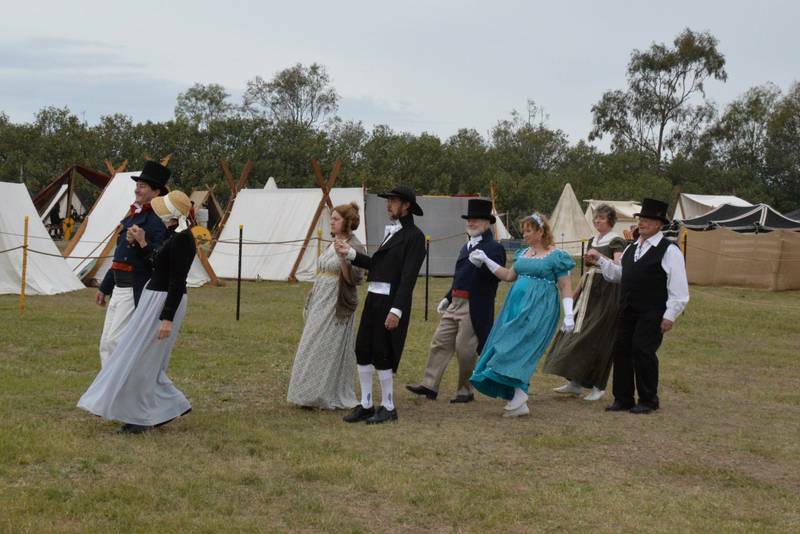 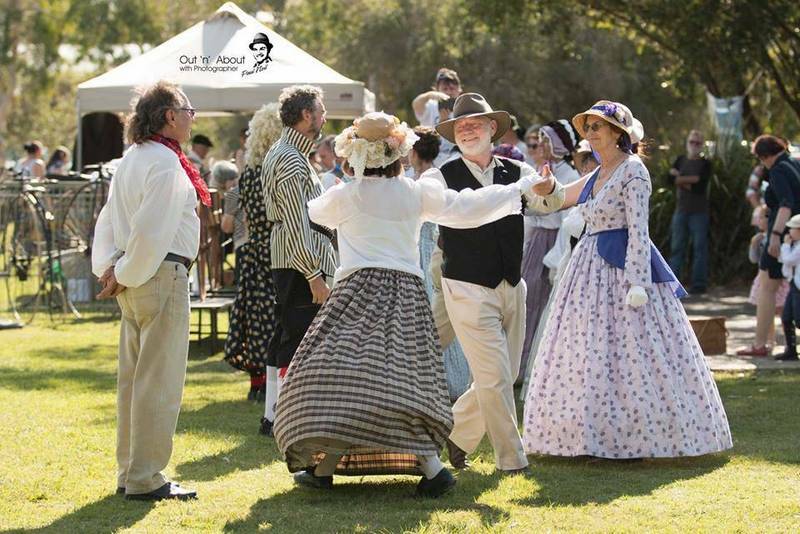 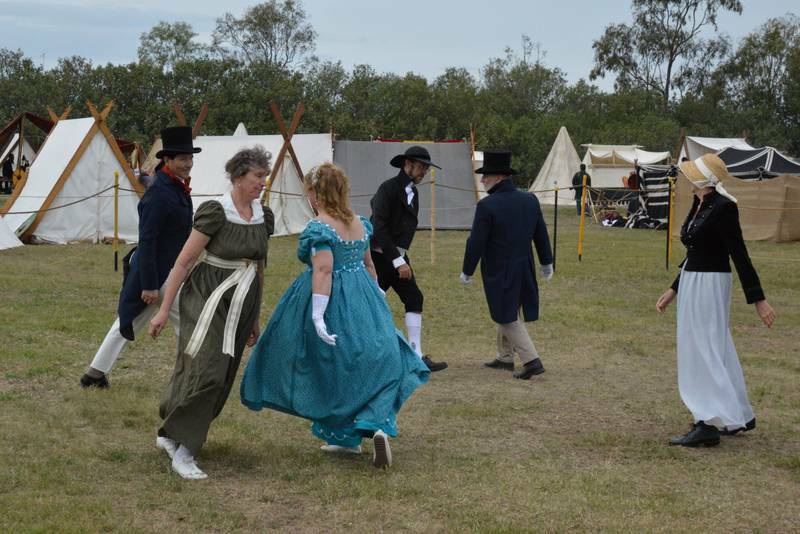 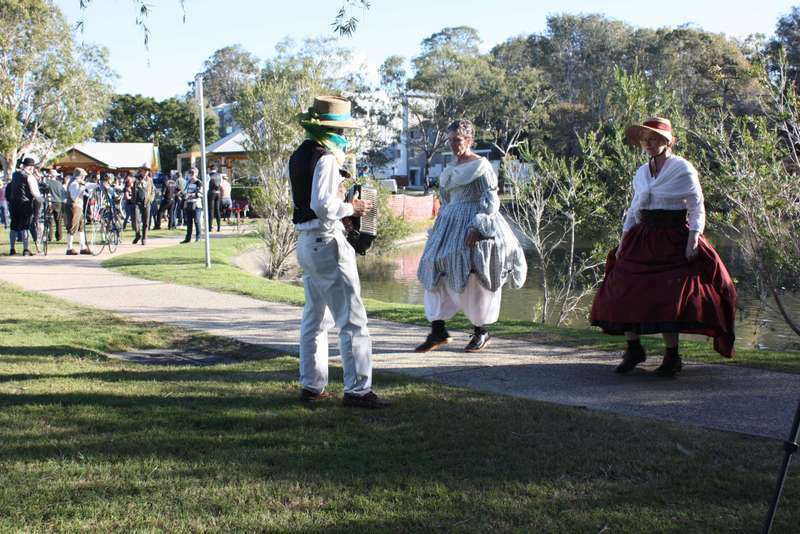 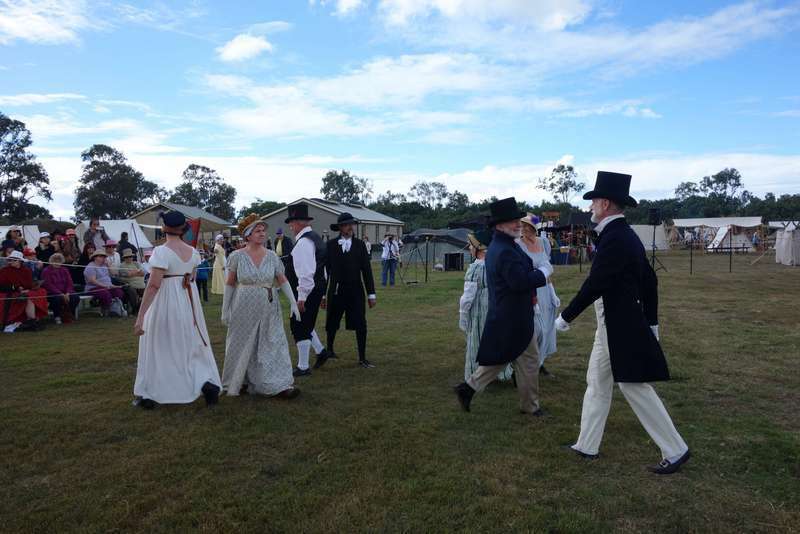 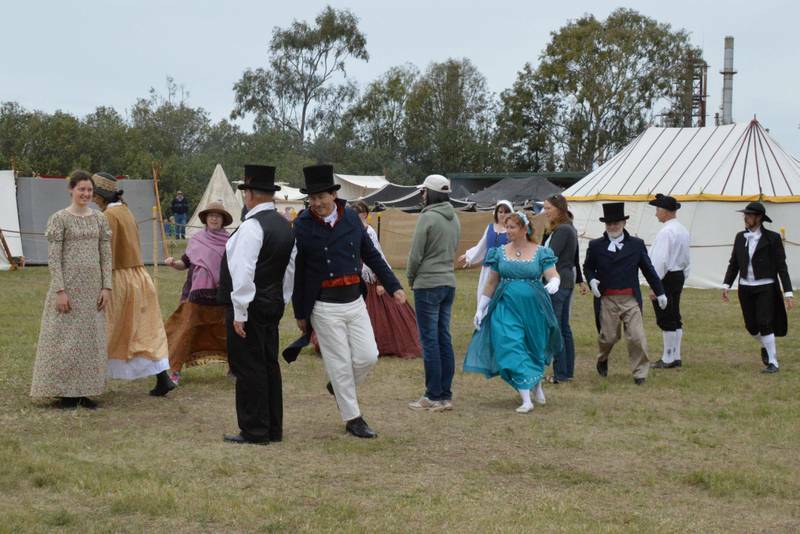 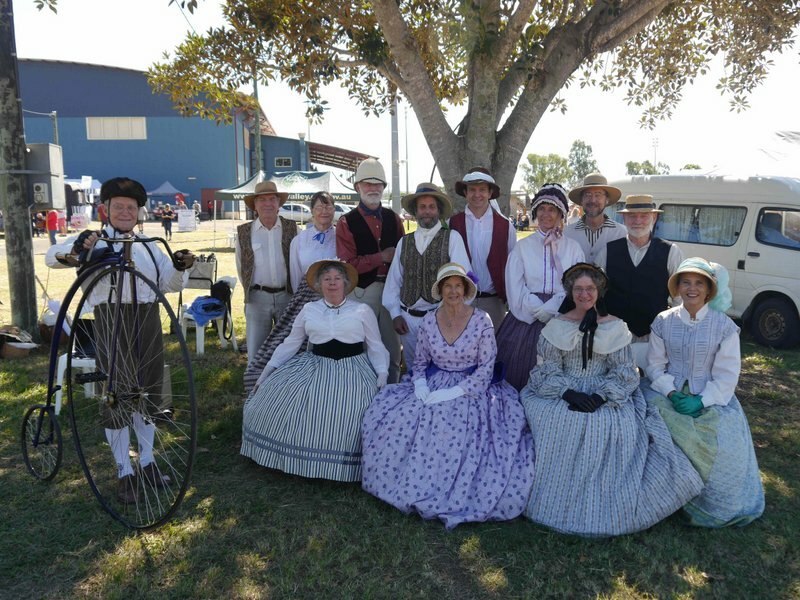 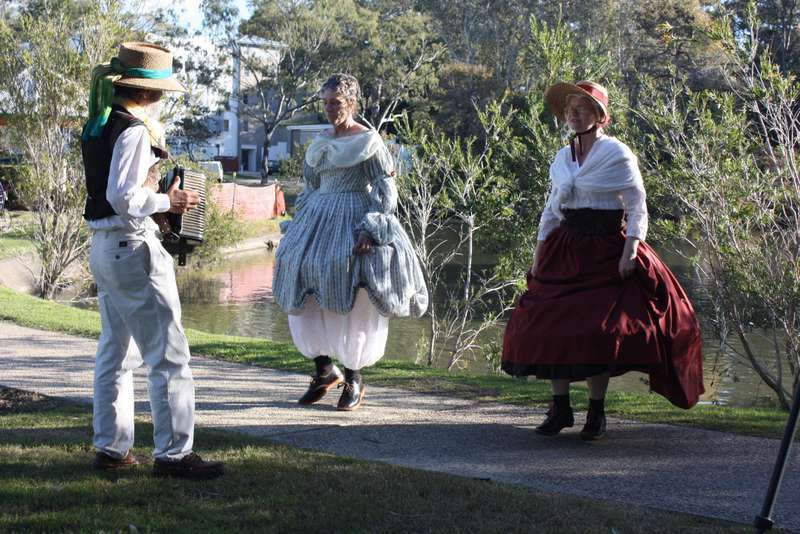 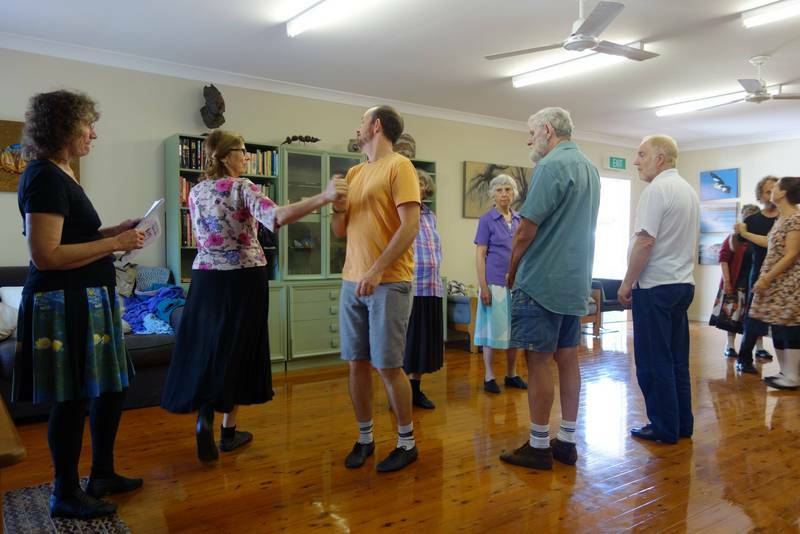 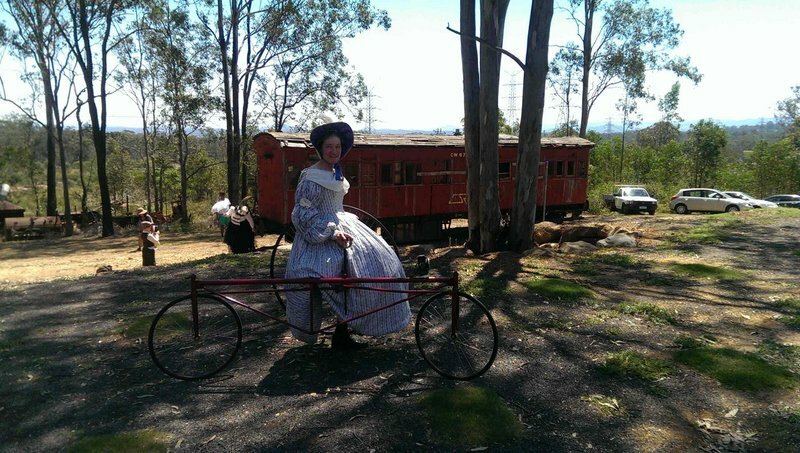 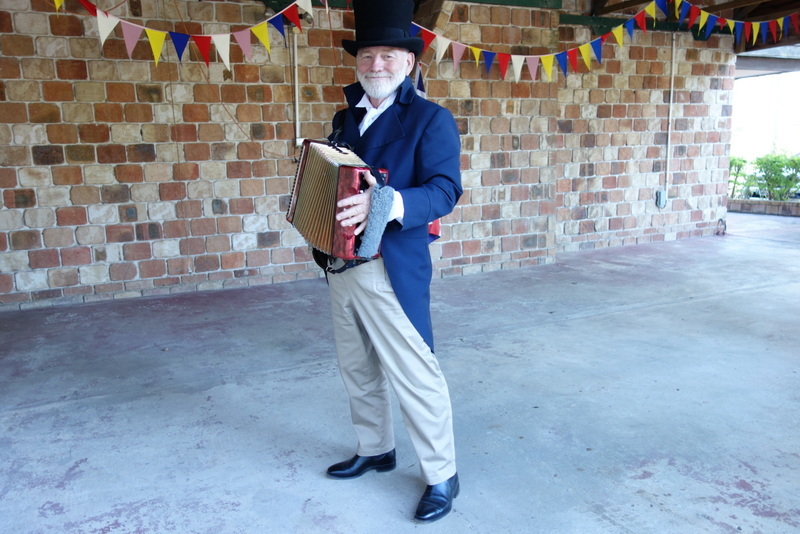 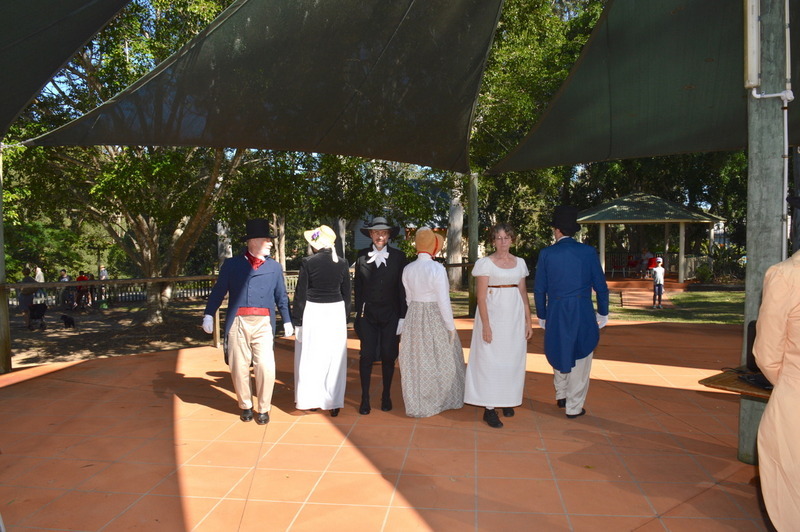 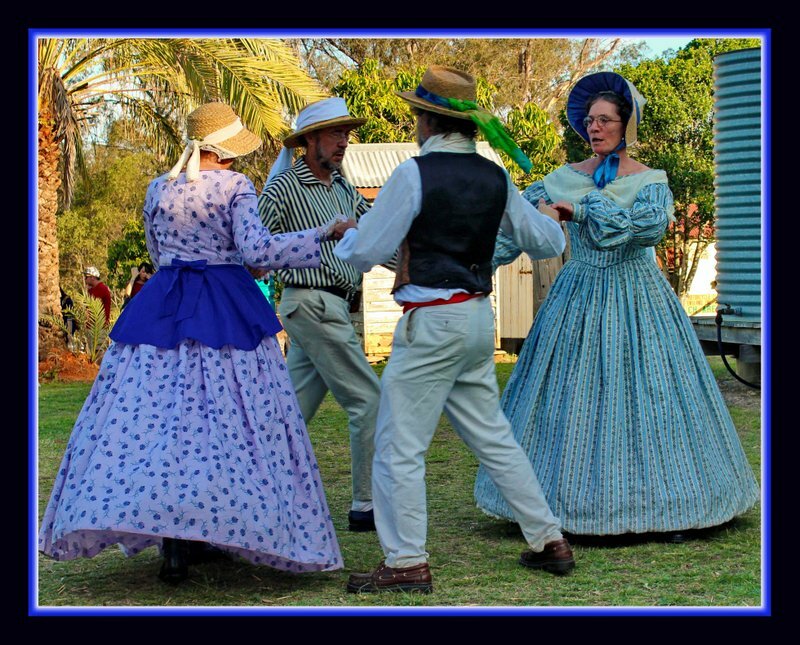 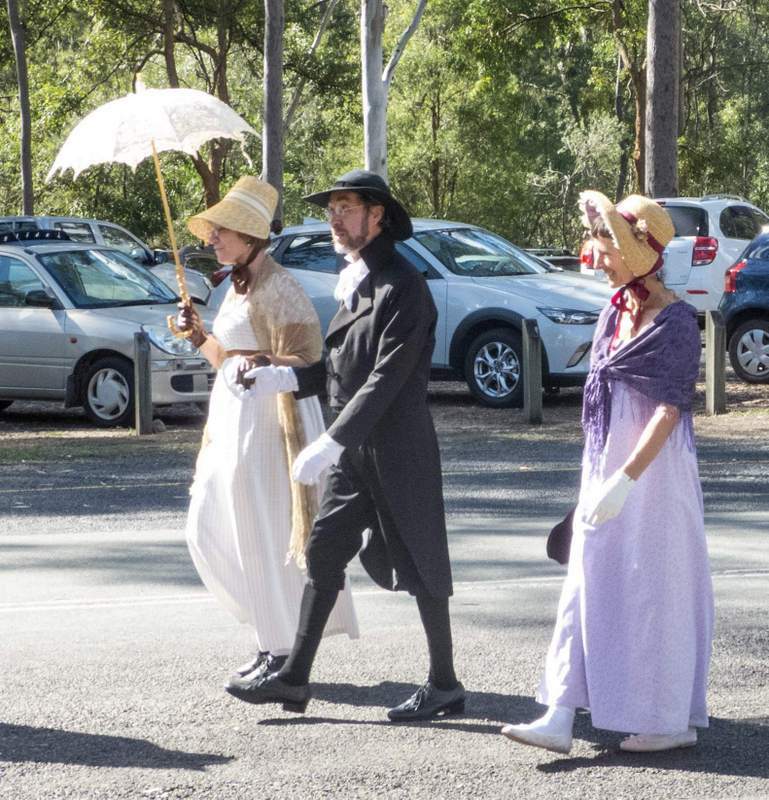 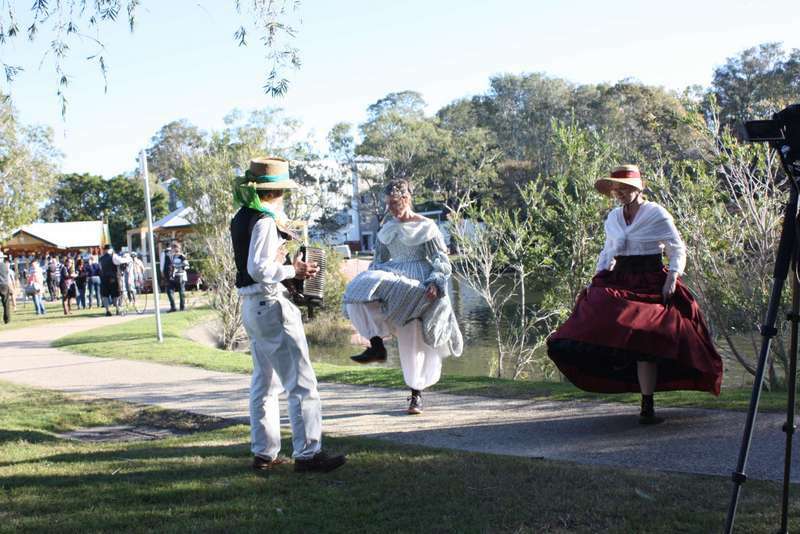 Dancing in Colonial costume around Cooneana Homestead Ipswich with Vic Blake reciting The Man from Ironbark. 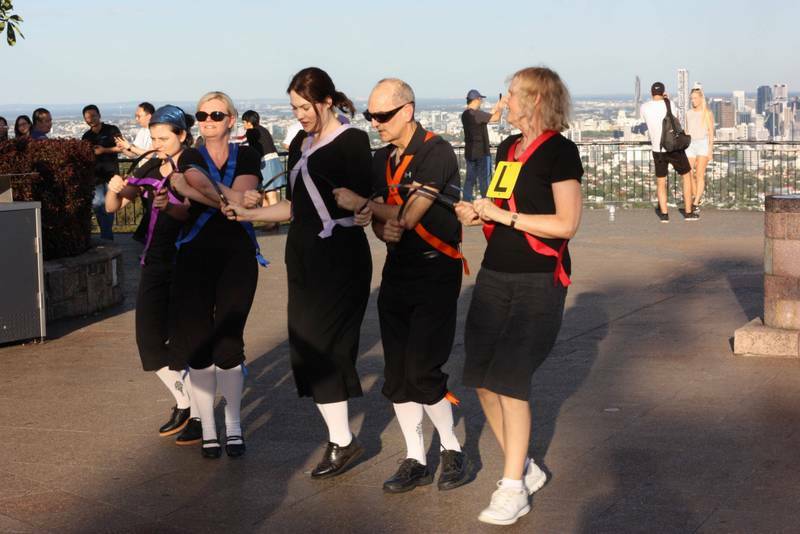 We dance sword around Brisbane starting on Mt Cootha, just because we can. 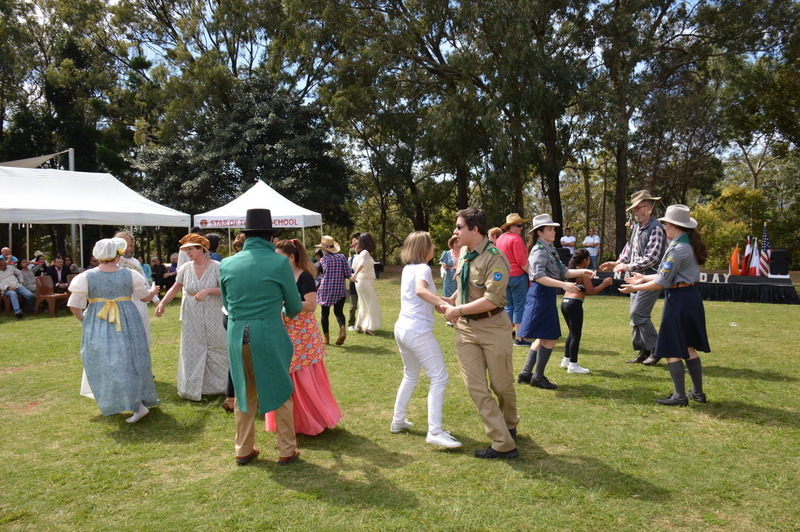 English Country Dancing at Picnic at Pemberley at the Abbey Museum. 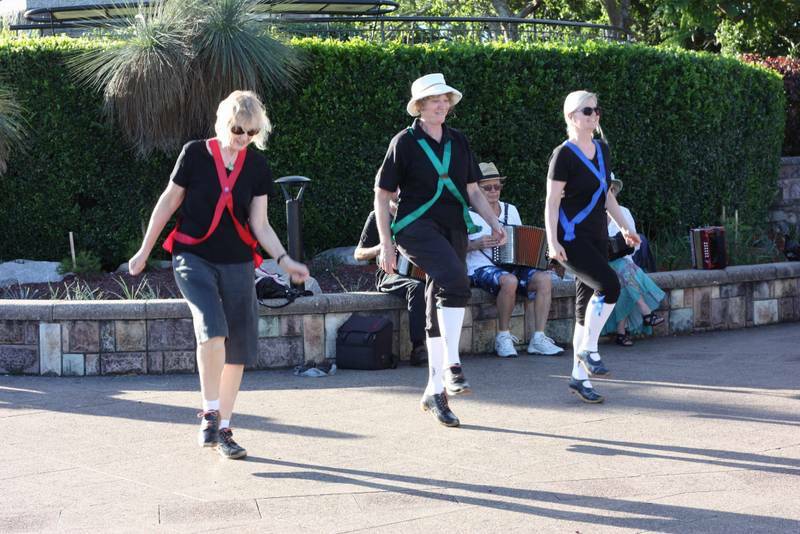 Rappers at the "You Should be Dancing Week" in Queens Gardens. 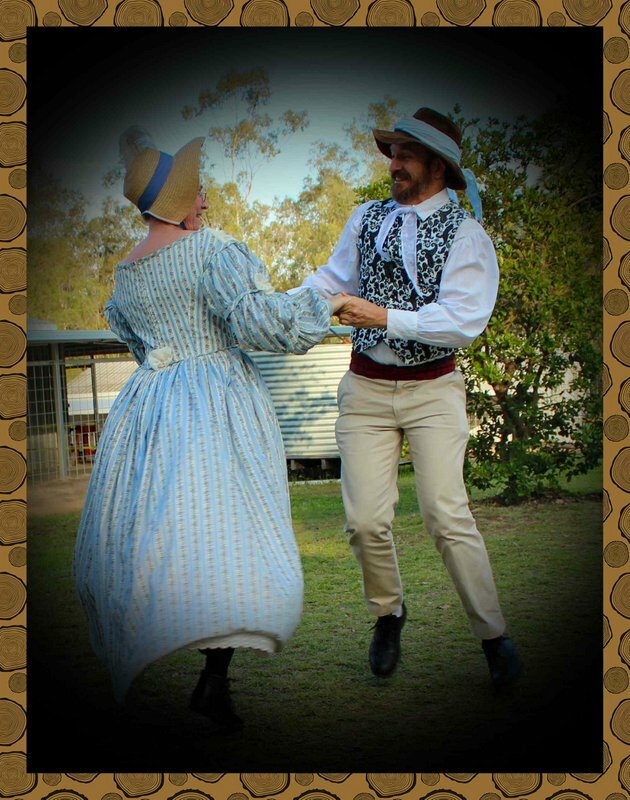 A dancing weekend on the fabulous Coochiemudlo Island featuring Appalacian Running Set. 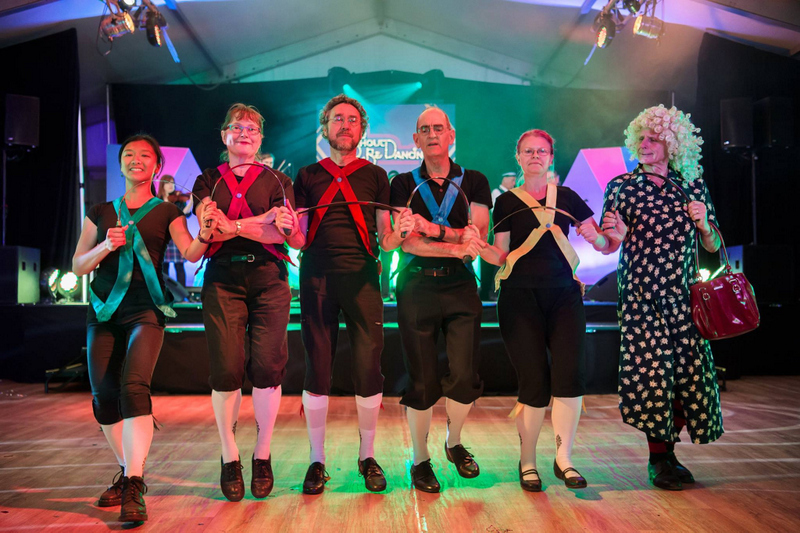 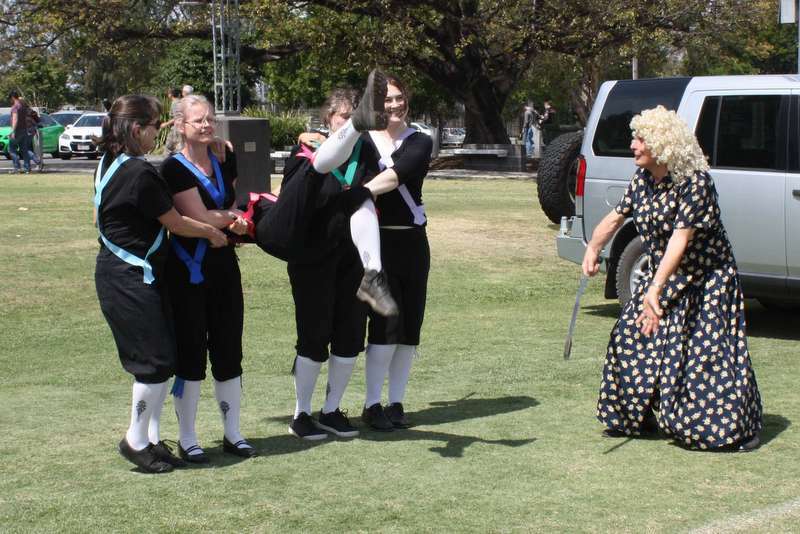 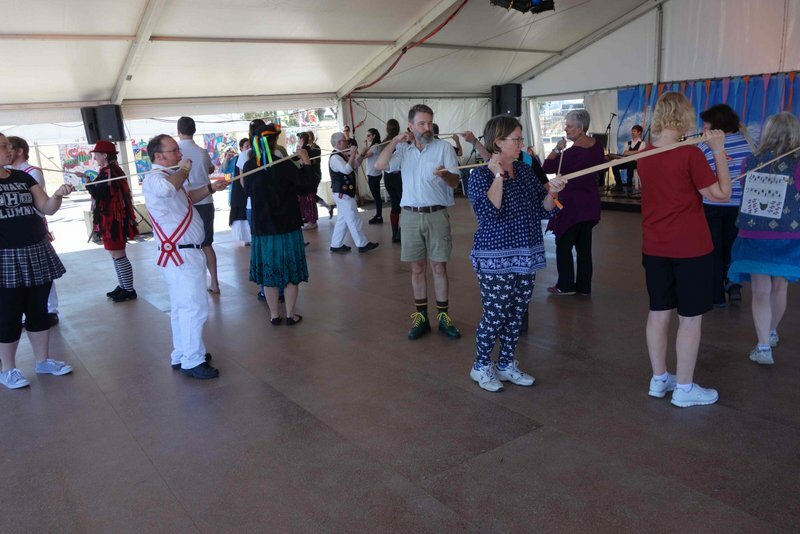 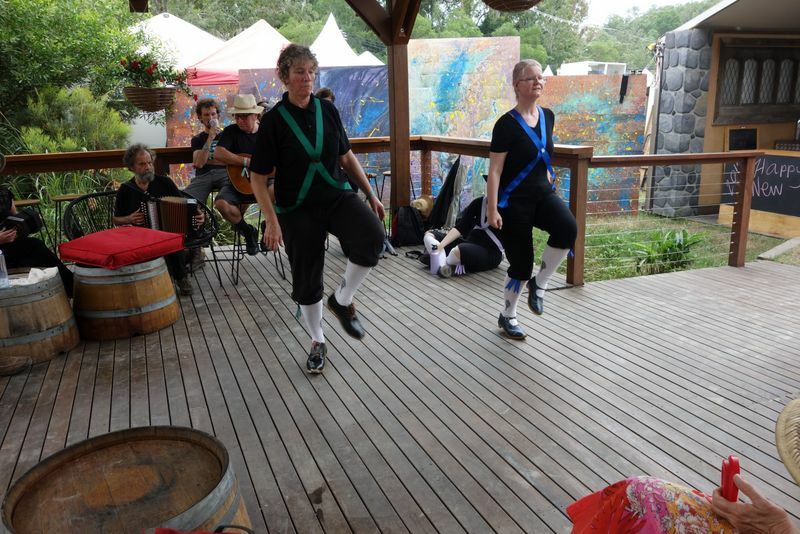 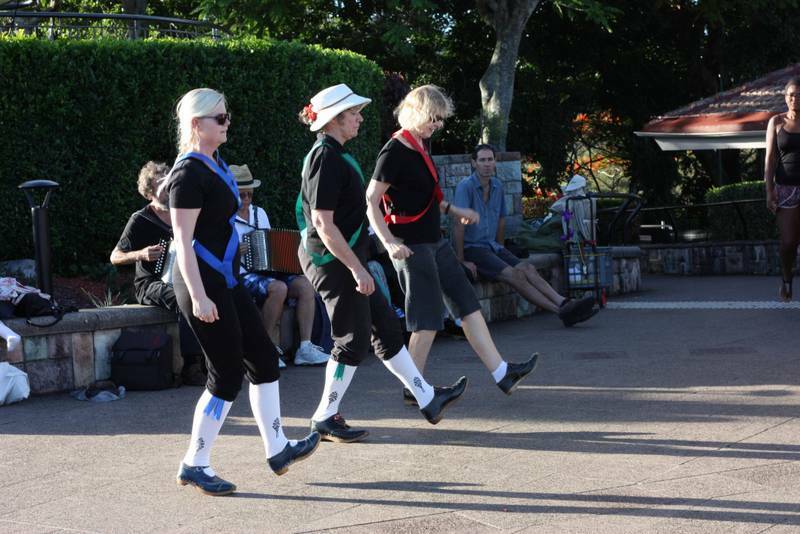 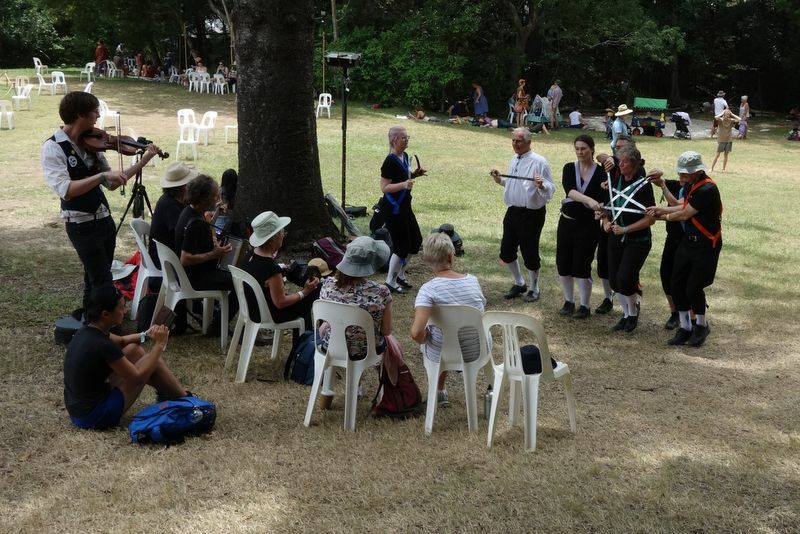 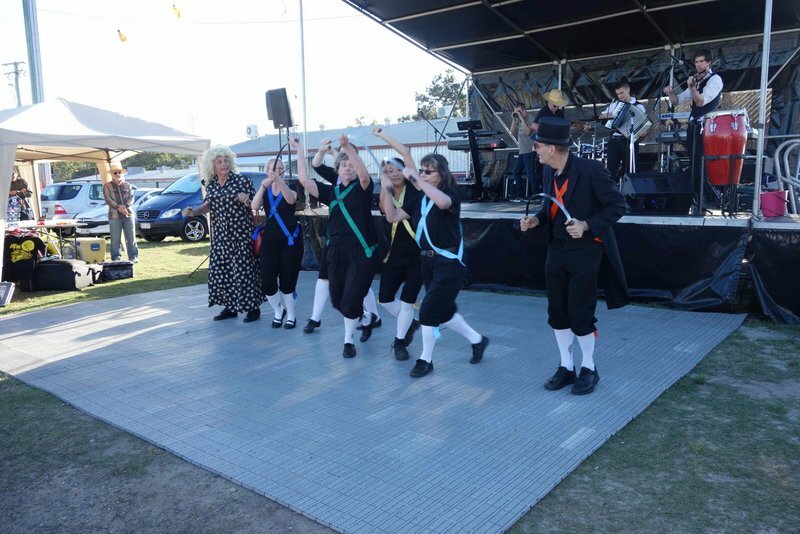 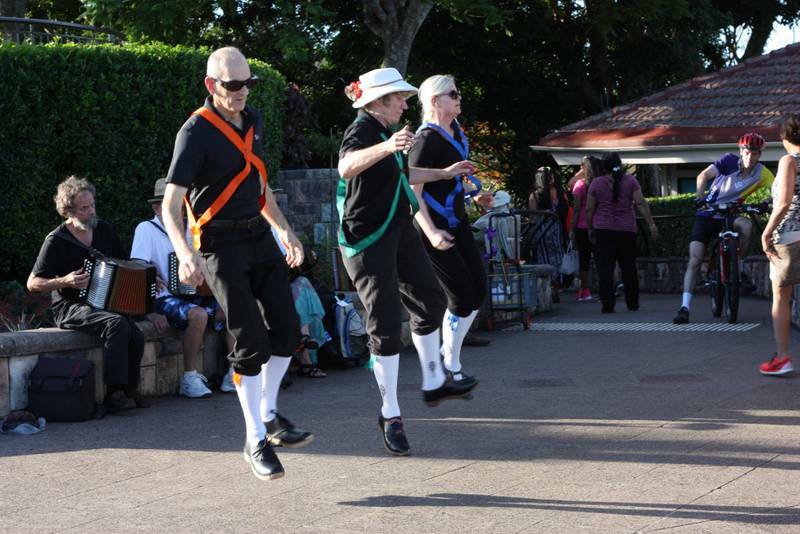 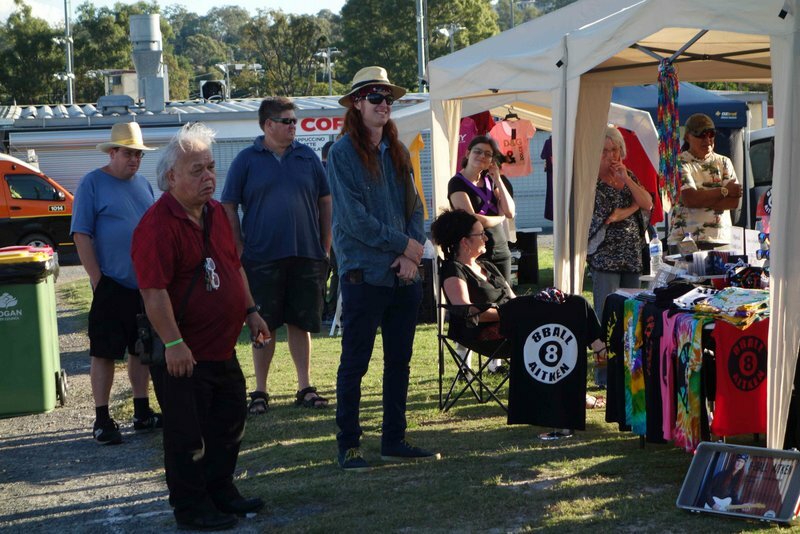 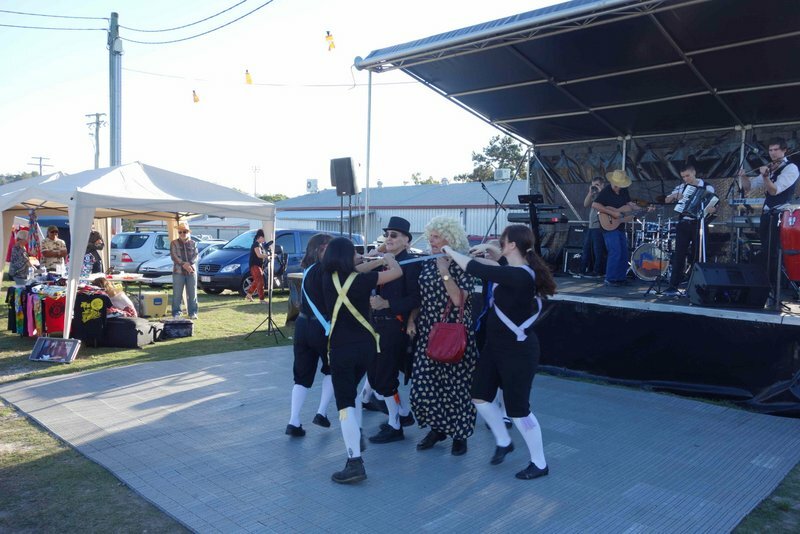 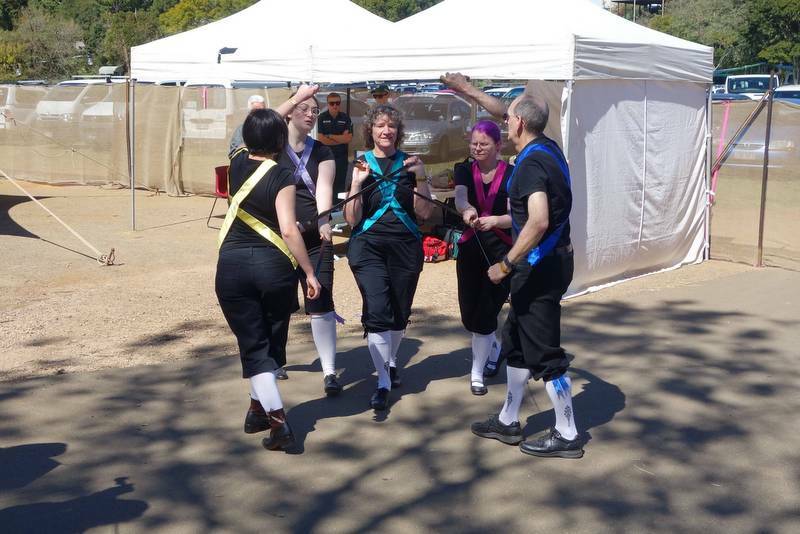 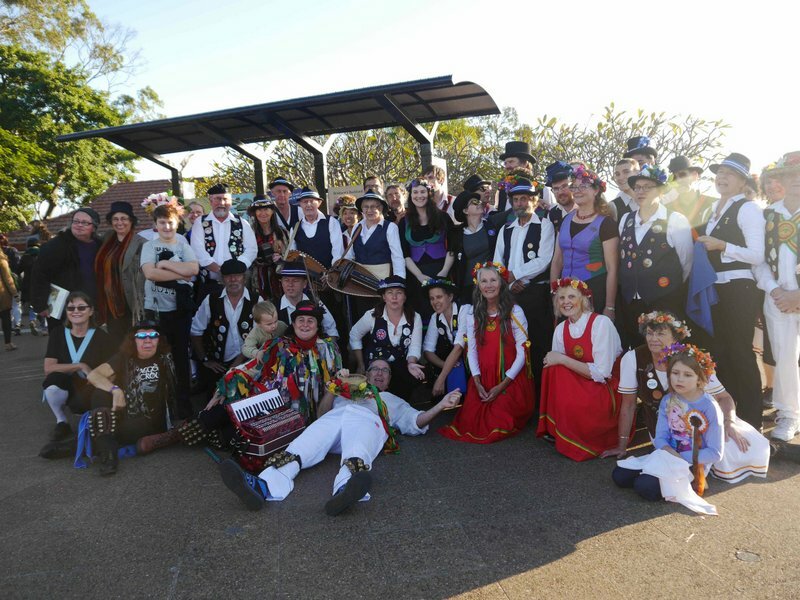 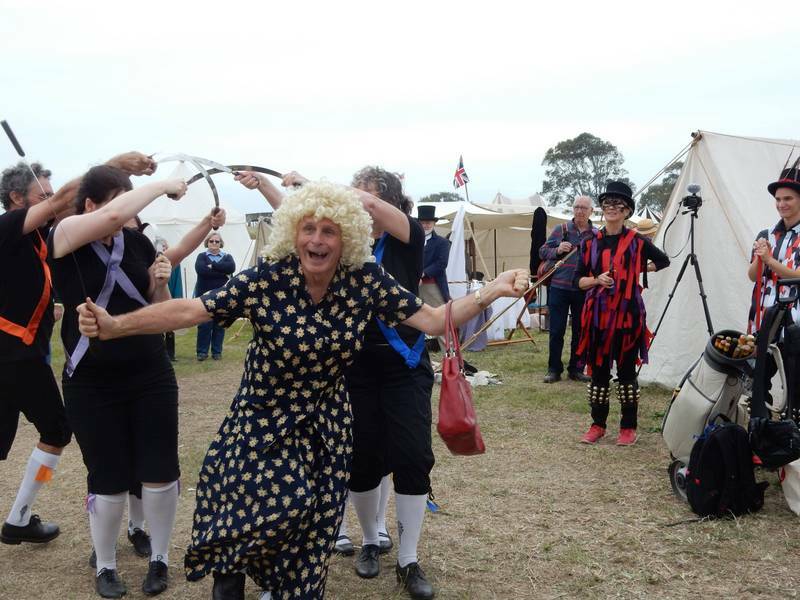 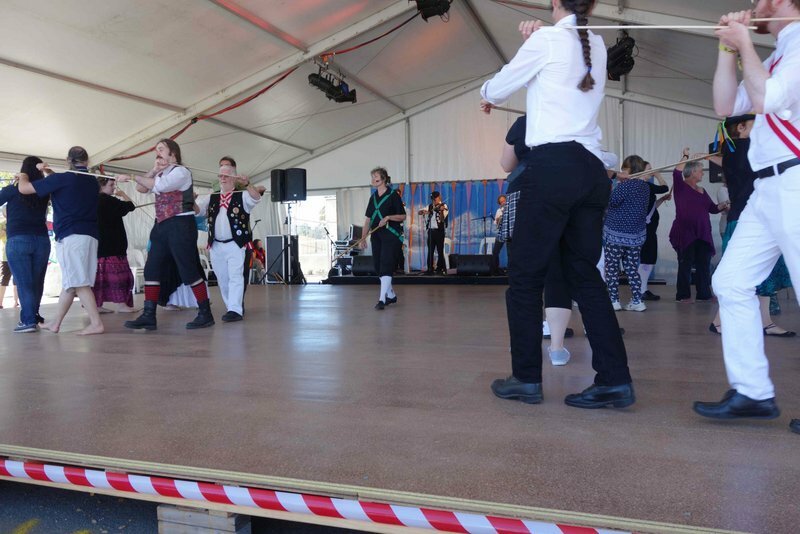 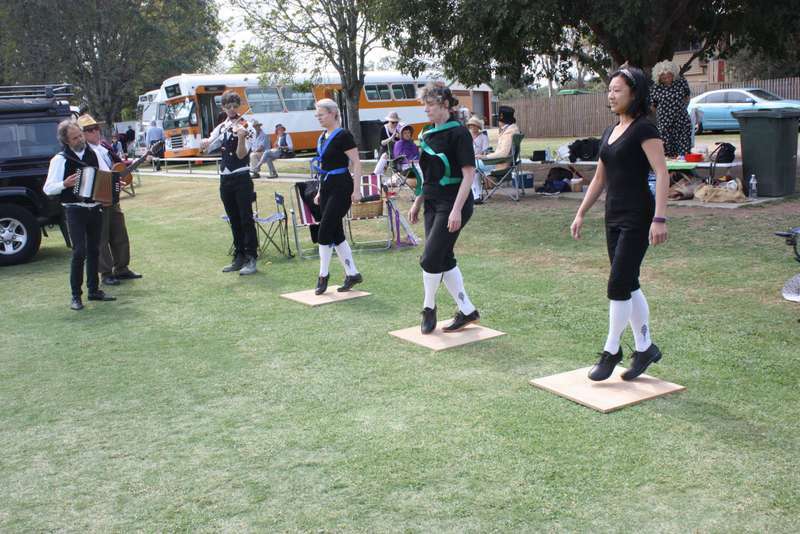 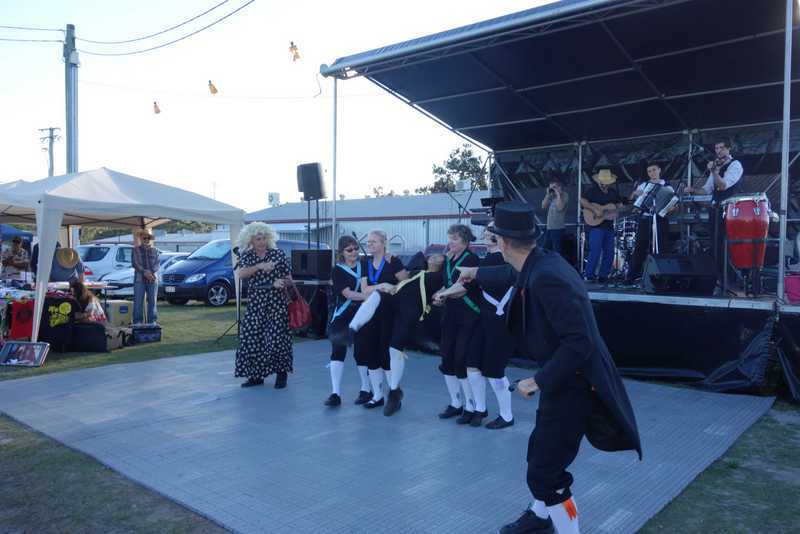 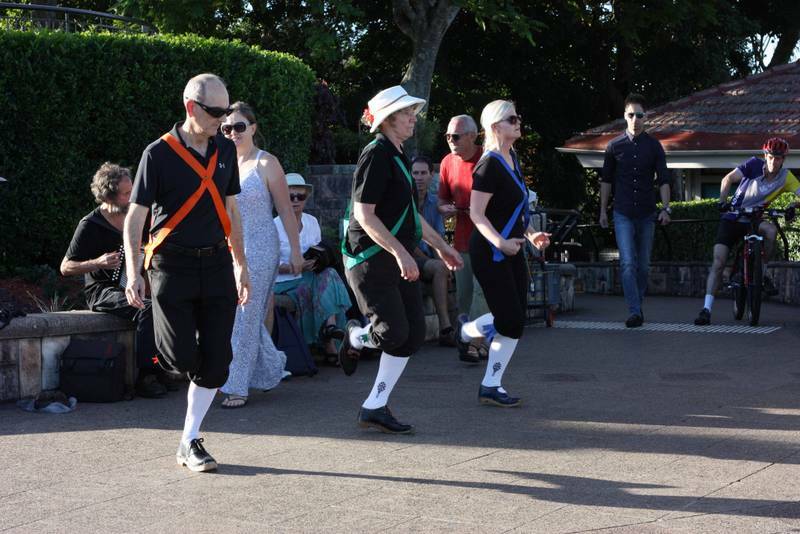 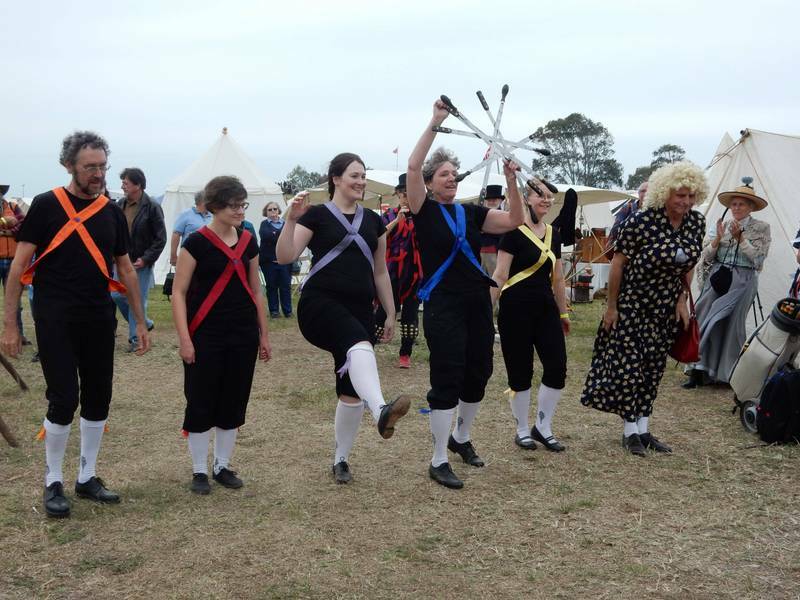 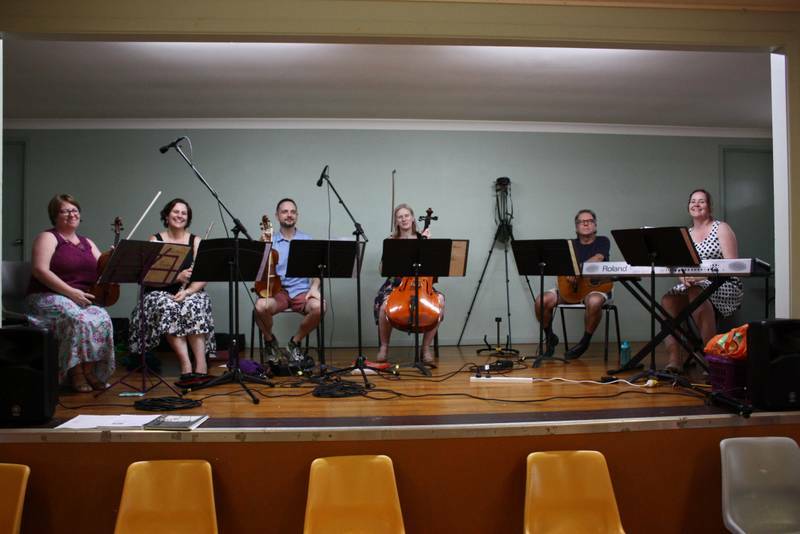 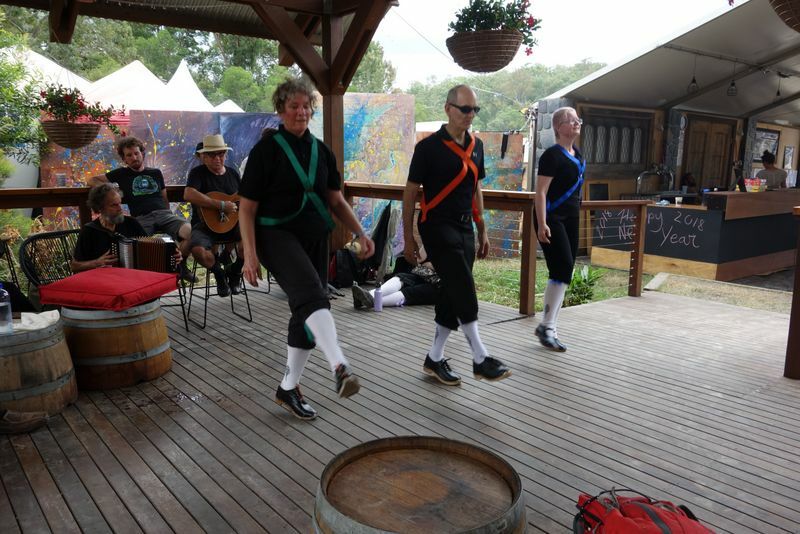 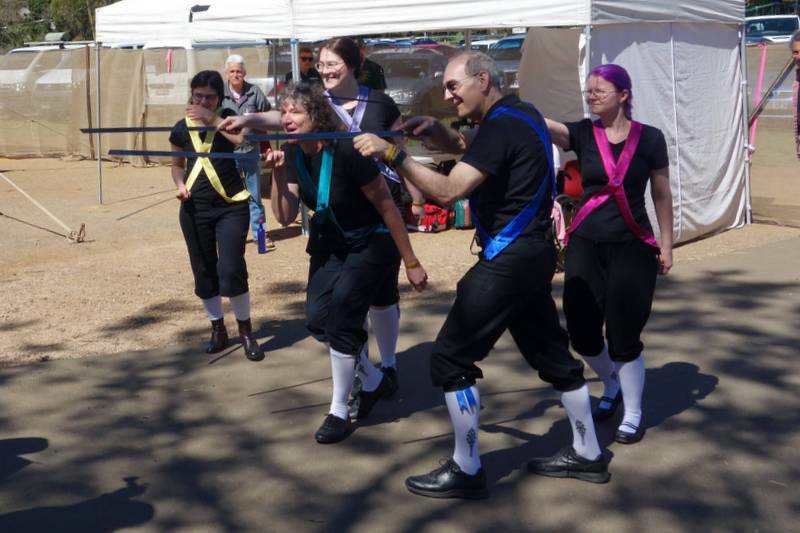 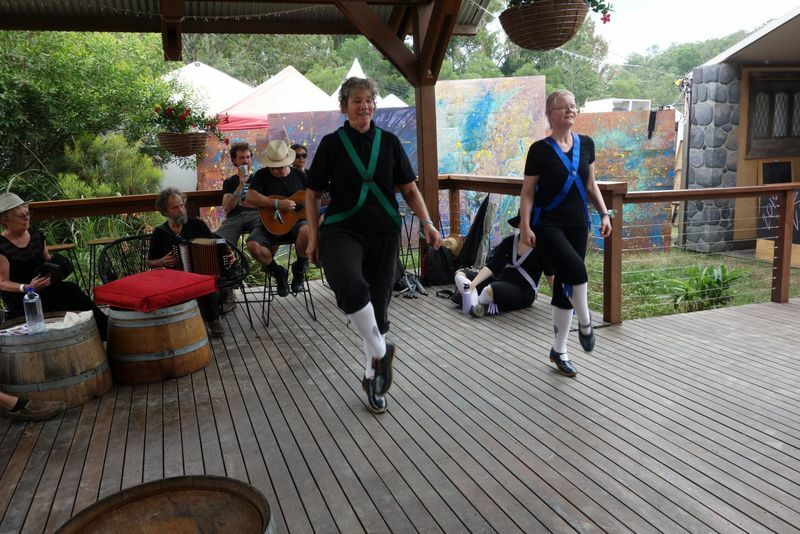 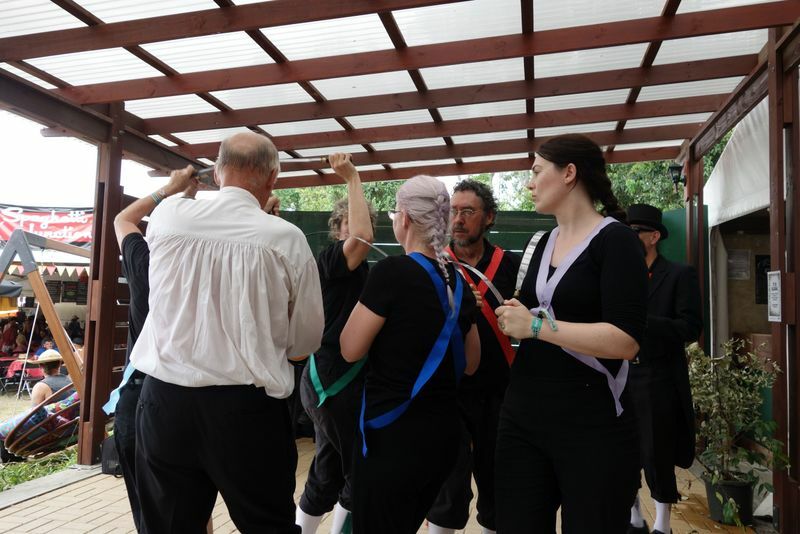 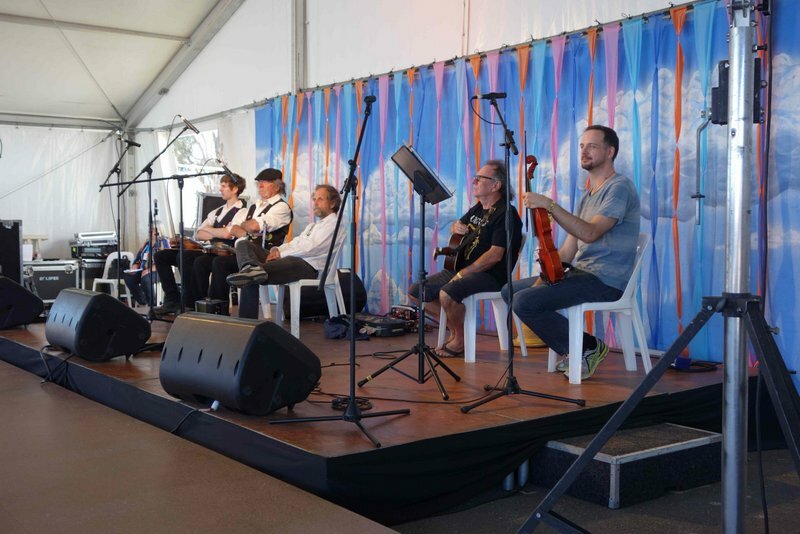 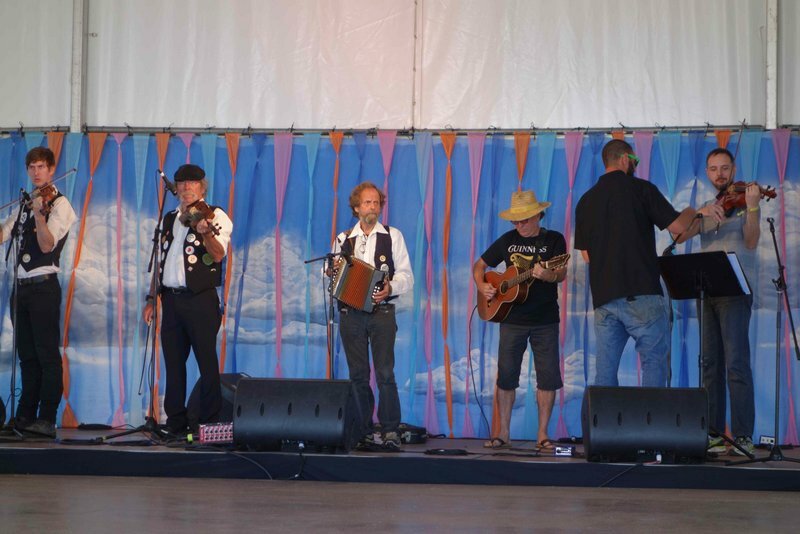 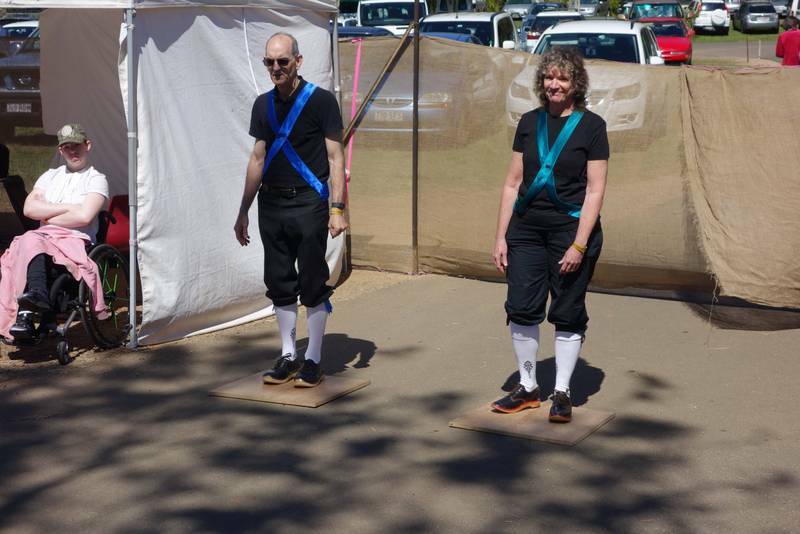 Sword and Clogging at the Maleny Music Festival. 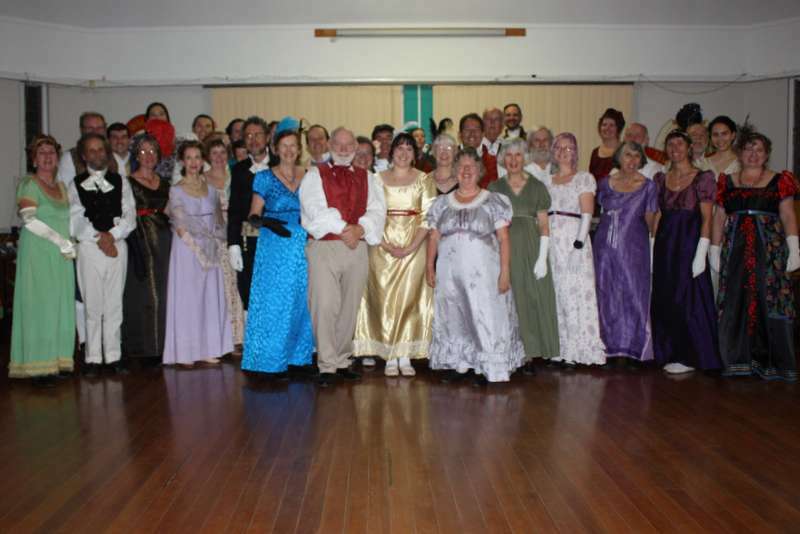 The Playford Ball organized by Sellenger's Round. 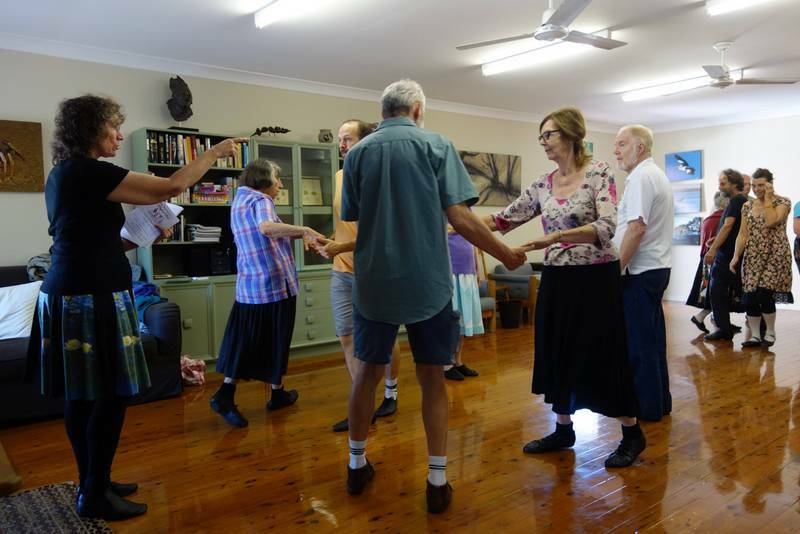 The band is Ben and Irene. 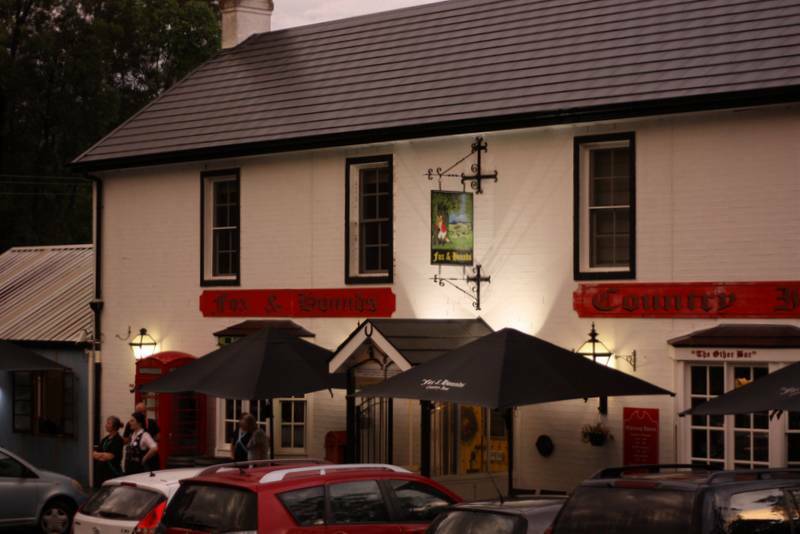 The famous Contra Free Night. 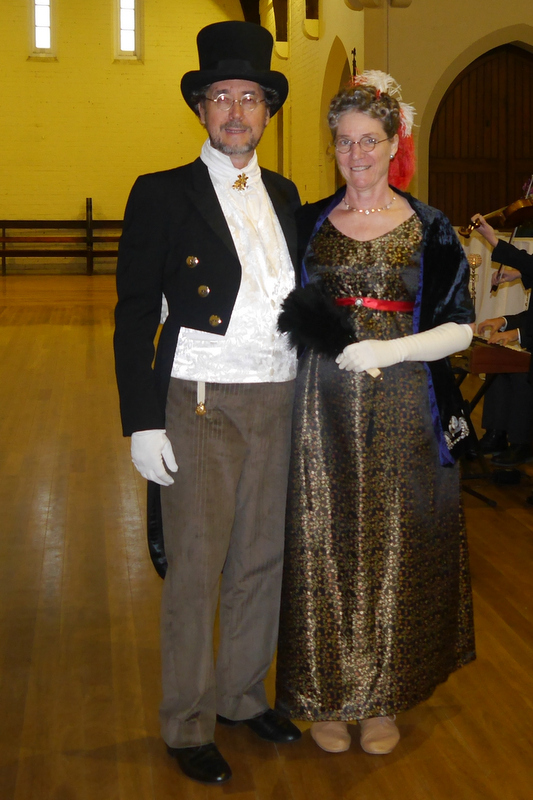 Our band leader Paul and caller Sheree. 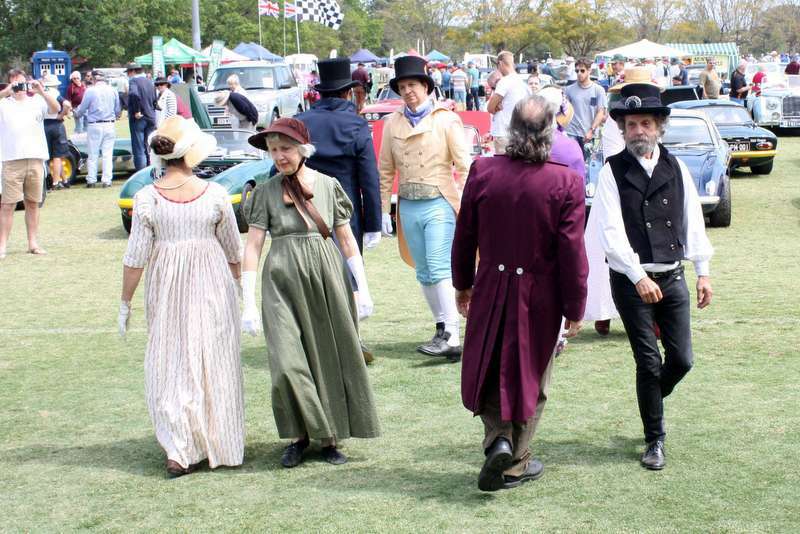 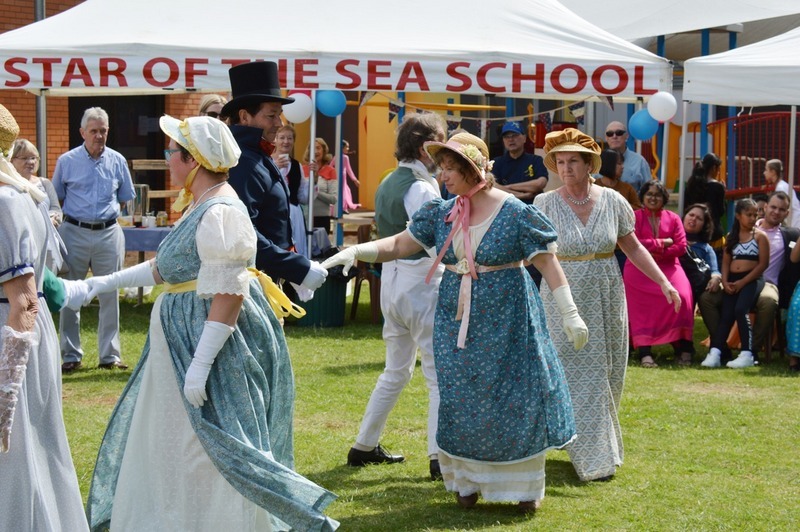 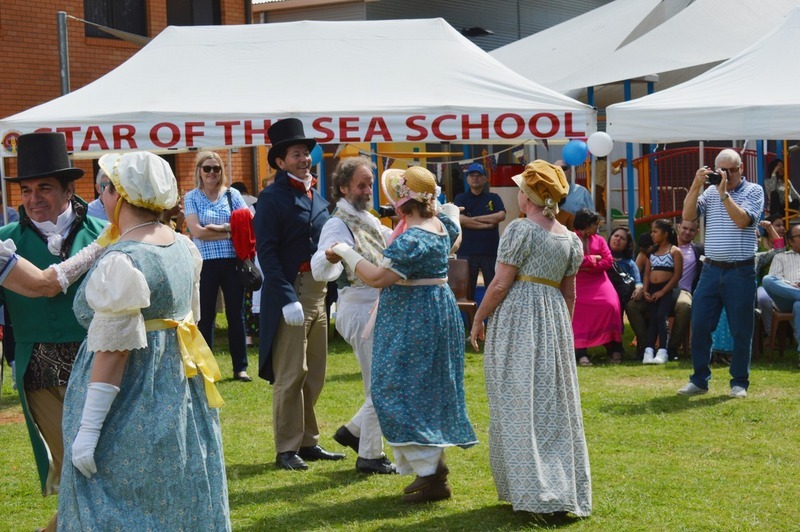 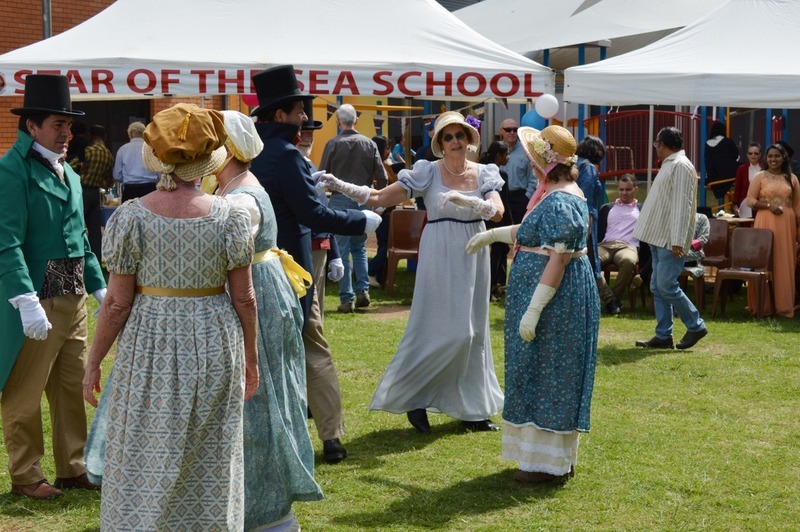 At Pennies by the Sea we provide Sword and Regency Dance. 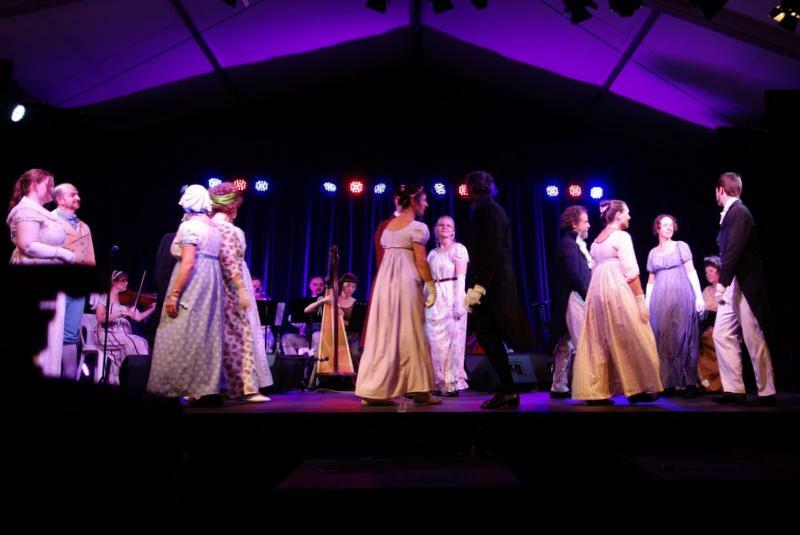 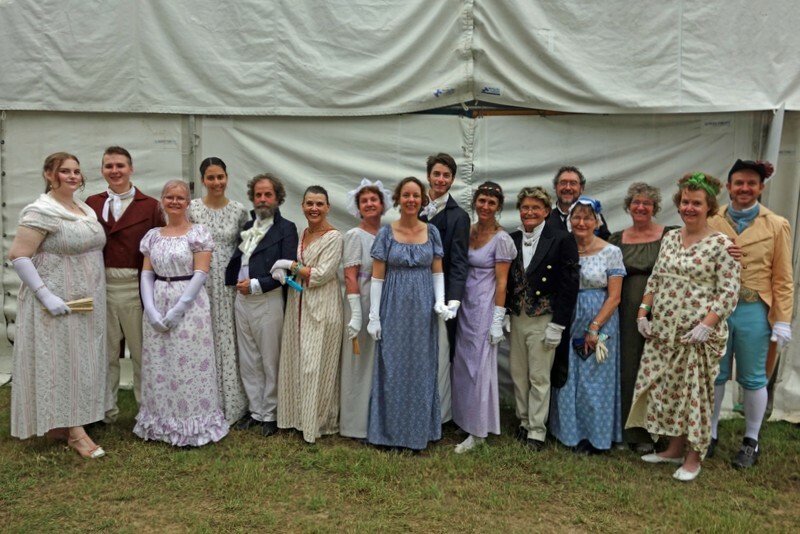 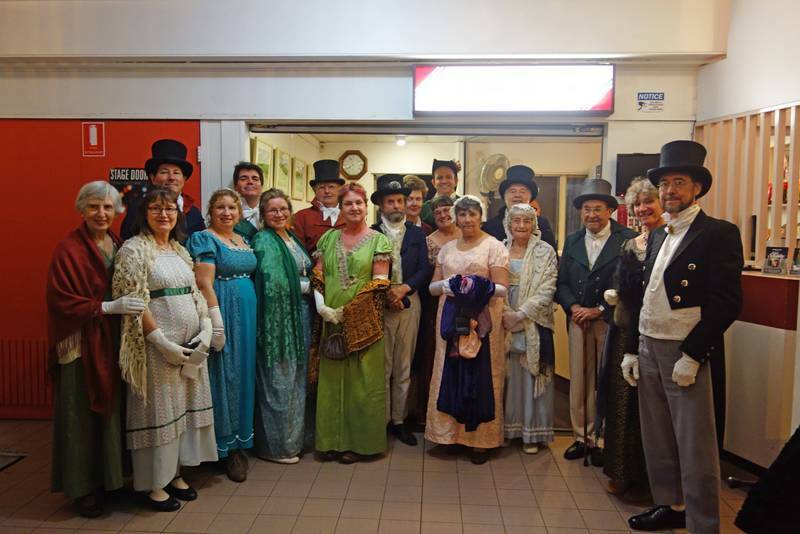 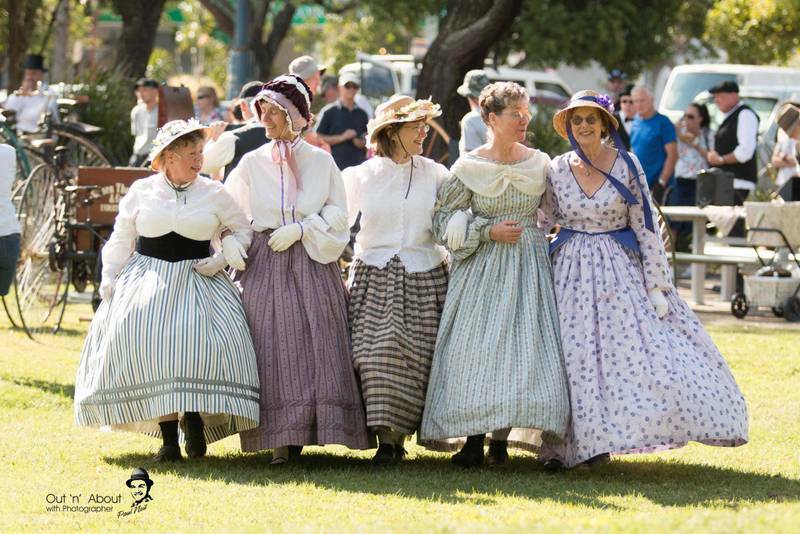 Opening Night of Love and Friendship from the book Lady Susan by Jane Austen at the Barracks Cinema and Dance Kaleidoscope is asked to put on a show. 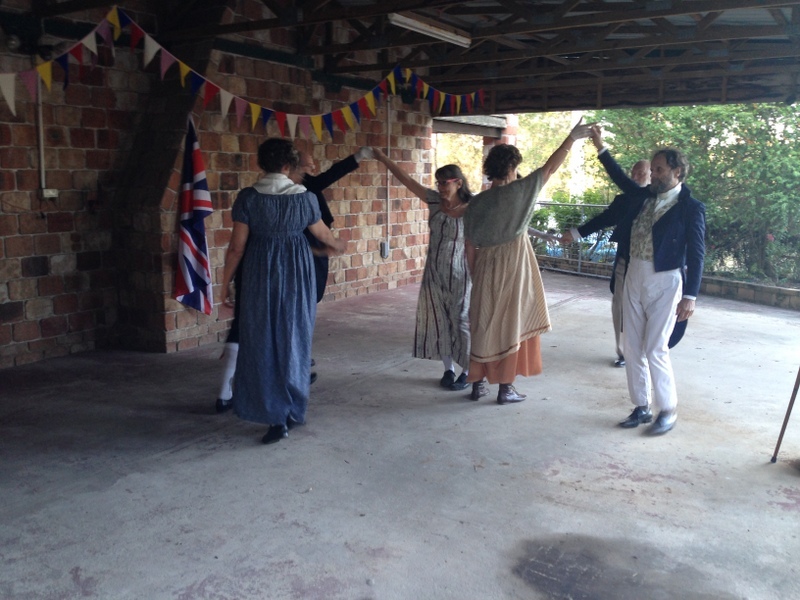 Dance Kaleidoscope went to the theatre to watch Sense and Sensibility at The Arts Theatre. 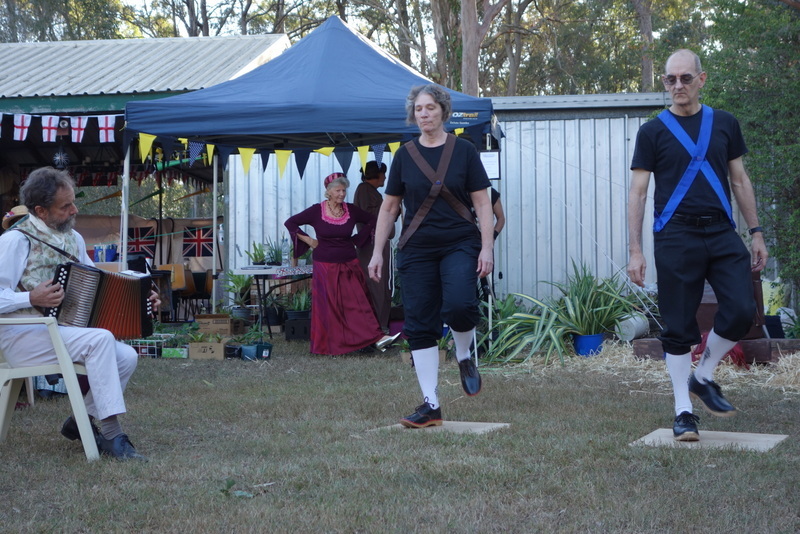 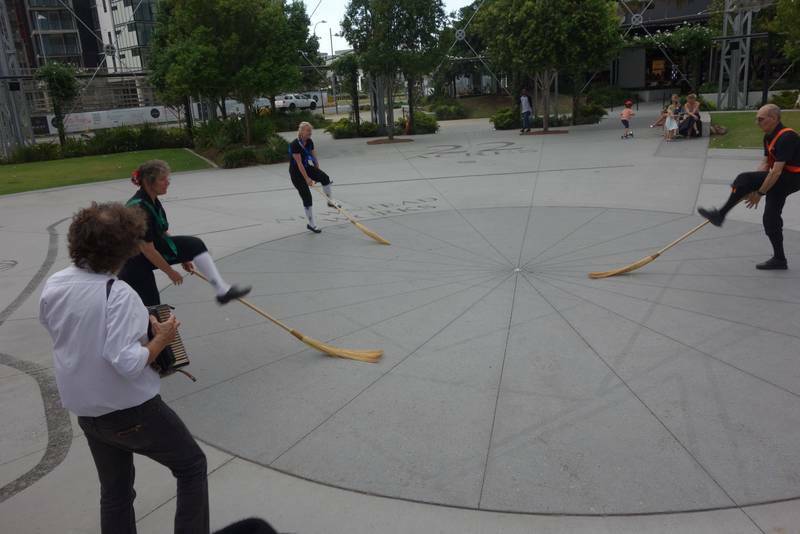 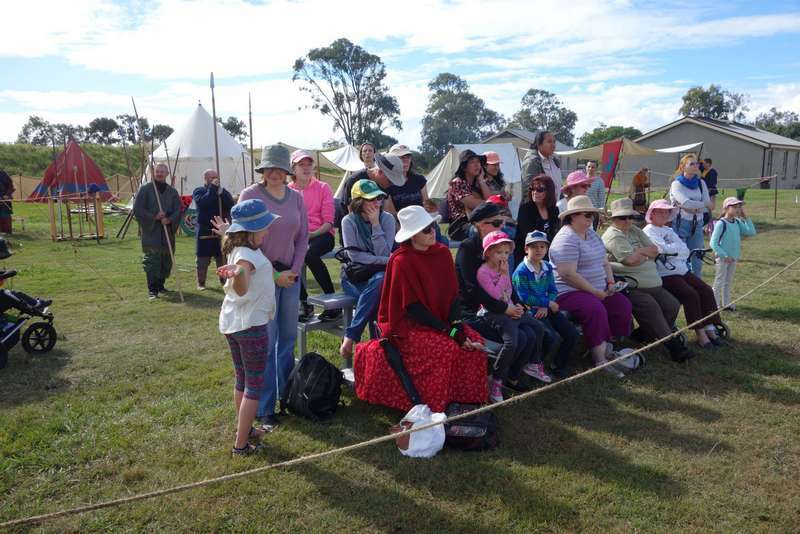 Rapper, Longsword, Broom and English Country Dancing at History Alive. 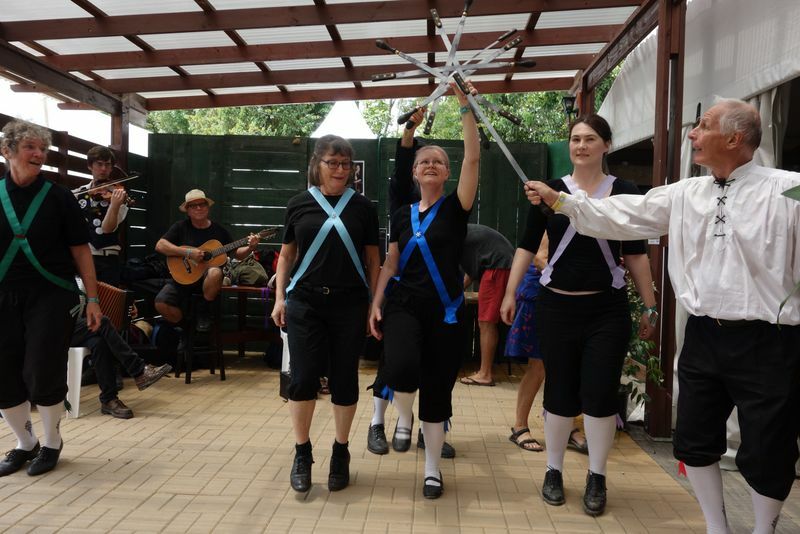 Dance Kaleidoscope entertain at The British Club Medieval Faire with Longsword and Clogging as well as Regency Dancing. 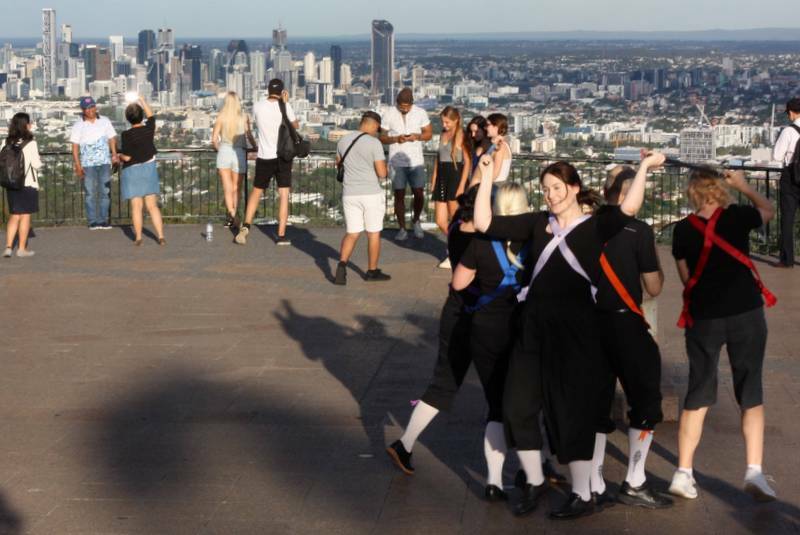 BRASS try to Dance Up the Sun on Mt Cootha Brisbane with Rapper Sword Dance - we did not succeed. 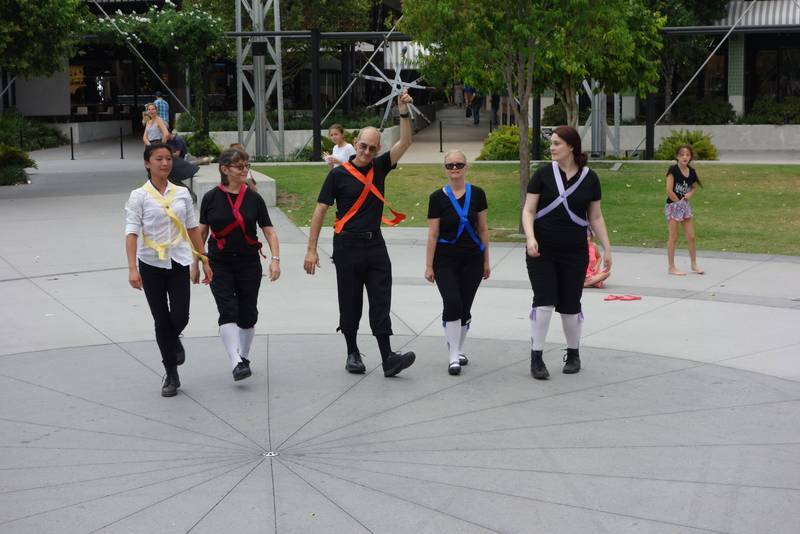 Dance Kaleidoscope perform Rapper Sword dance on the street. 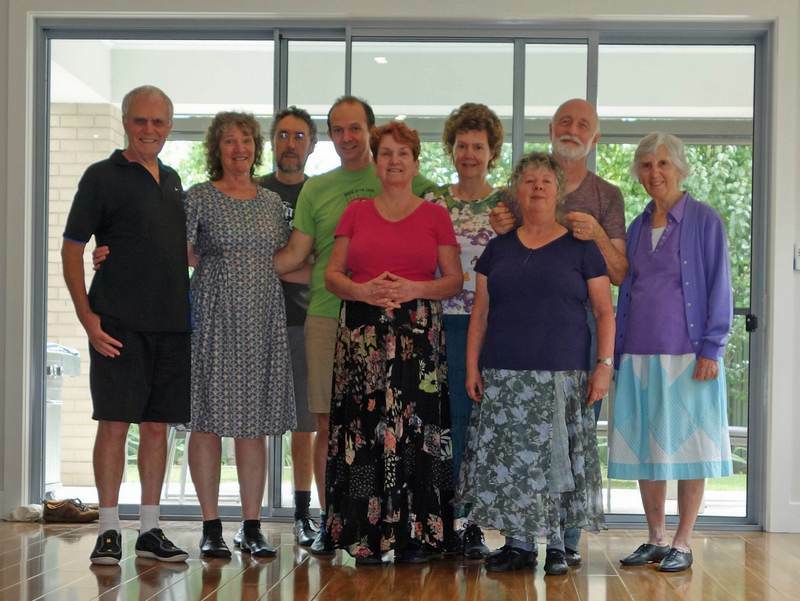 Ron Coxall from England held a dance camp for Dance Kaleidoscope. 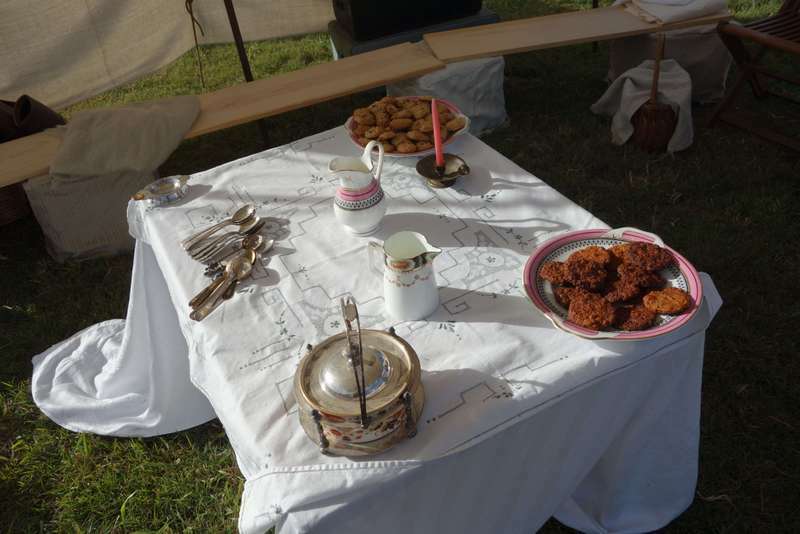 One of the highlights was the Appalachian Running Set. 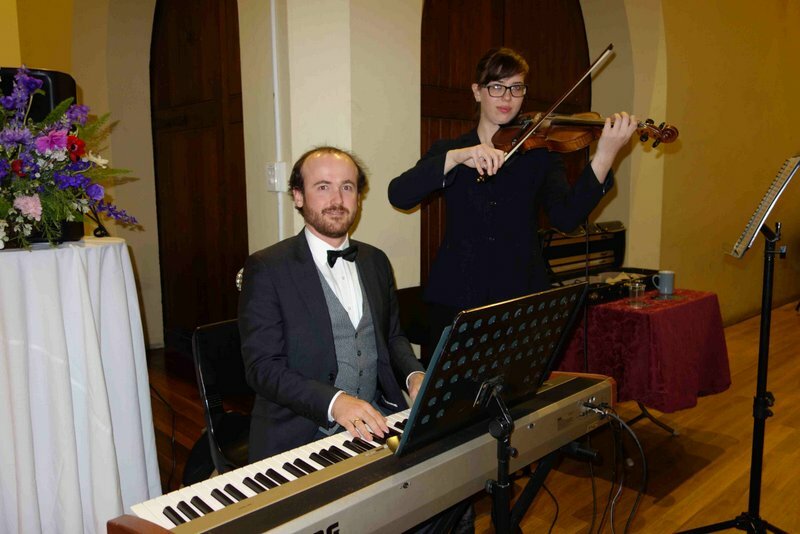 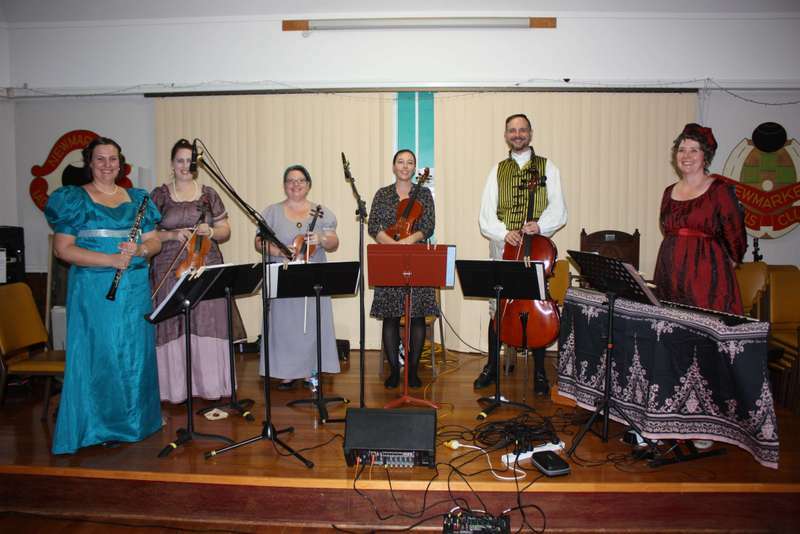 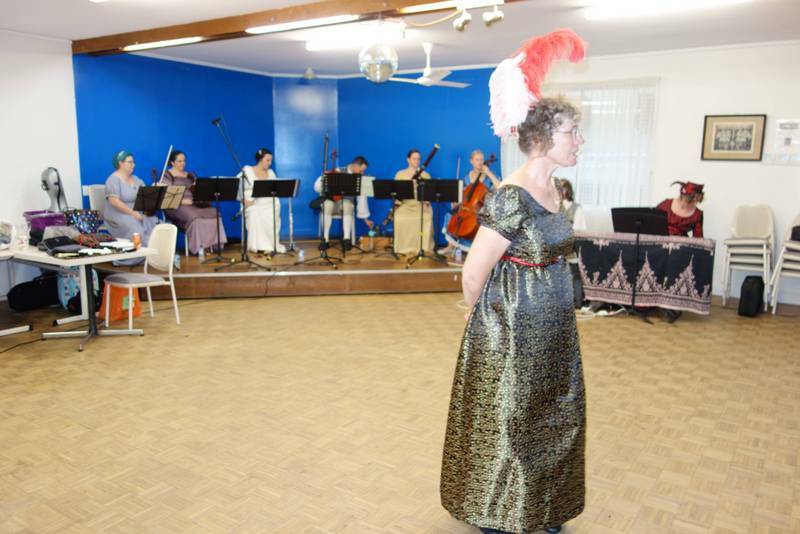 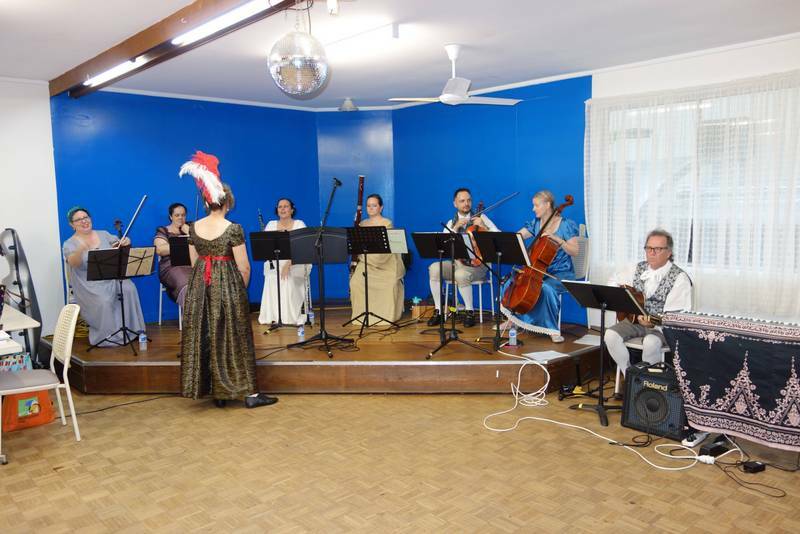 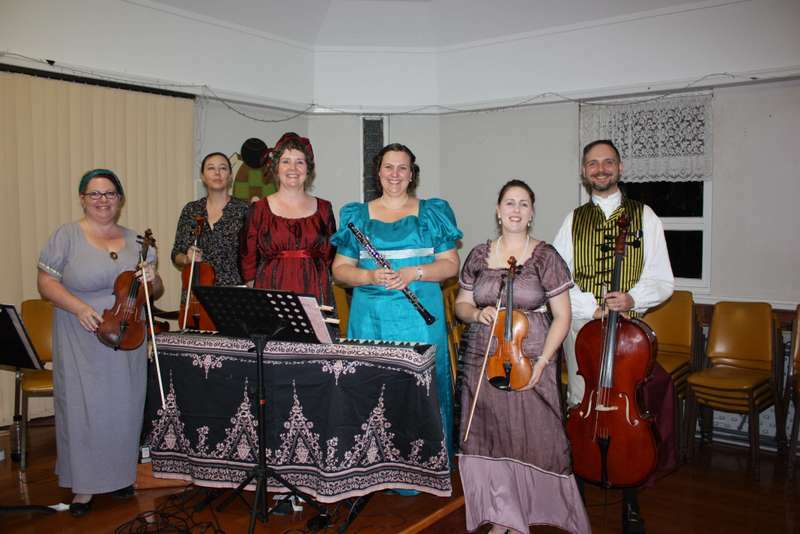 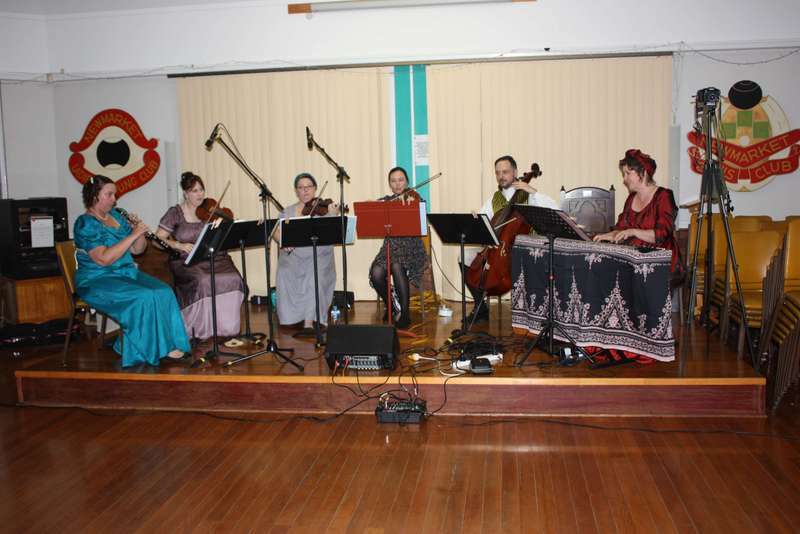 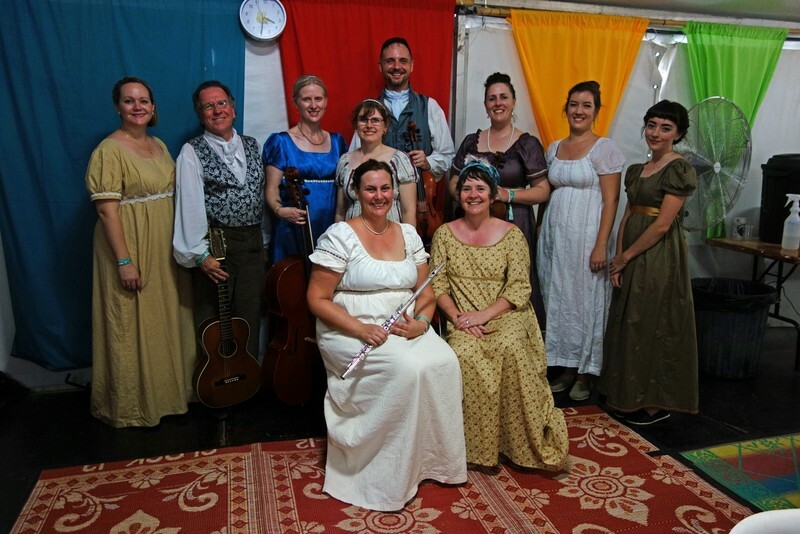 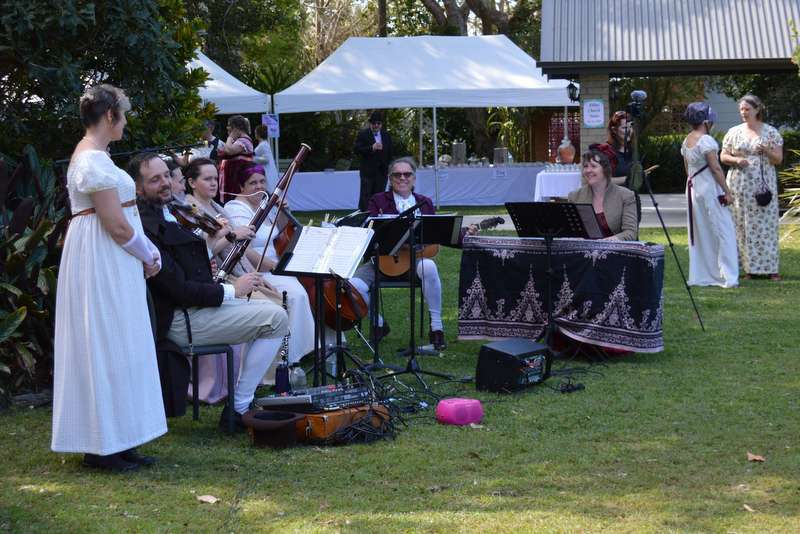 Dance Kaleidoscope commences the year with a Regency Dance - with our own special band Sounds Austen.